Agri-Analysis LLC is an independent agricultural diagnostic laboratory which provides clients with access to state-of-the-art laboratory techniques and procedures to answer their agricultural production problems. We employ enzyme-linked immunosorbent assay (ELISA), polymerase chain reaction (PCR), as well as traditional culturing and numeration methods to detect and identify specific viral, bacterial and fungal pathogens in plant material, seed and soil. Our customers include growers, management companies, growers associations, agricultural consultants, universities, research institutes, service laboratories, seed companies, real estate agents, and property owners, etc. Agri-Analysis was founded in 1981 by plant pathologist Glenn Friebertshauser, who desired to establish his own laboratory to diagnose plant diseases after completing his studies in University of California, Davis. His interest spanned fungal, viral and bacterial pathogens of plants, vines, trees and soil. His initial service to the agricultural community was in the development of a commercially applicable assay for lettuce mosaic virus (LMV), allowing for screening of virus-free lettuce seed lots before planting. In the mid-80's he became interested in diseases of grapevines and saw the need in the industry for laboratory assays to diagnose the presence of viral pathogens such as fanleaf virus, leafroll associated viruses and corky bark virus. Later, he developed additional assays for the bacterium Xylella fastidiosa (causal agent for Pierce's Disease in grapes and almond leaf scorch) and fungal diseases, notably those associated with Esca, also known as young vine decline. As the world is faced with increasing risks and challenges from economically important plant diseases, Agri-Analysis is your trusted laboratory partner in identifying, managing, and mitigating these risks and challenges across multiple industries worldwide through knowledge, experience, innovation, dedication, cooperation and uncompromising integrity and professionalism. Agri-Analsyis LLC offers ELISA Reagents for detections of more than 200 plant viruses, 18 bacteria, one fungus and one Bt GMO, and testing supplies. For detailed product information, please select Product Items and Product information. Testing Supplies include ready-to-use test buffers, substrates, block reagents, surfactants, ELISA plates, plastic wares and much more. For testing cost, please contact us or email us at info@agri-analysis.com or call 1.800.506.9852. Red Blotch Outbreak or False Negative Testing? Knowledge of Red Blotch Virus Variation within a Vine and Between Vines Can Aid in Accurate Diagnosis. rootstock distant from the graft union. 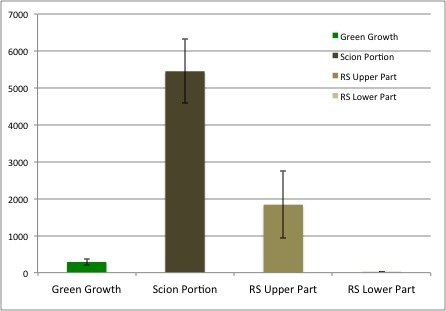 The new green tissue tissue had a relatively low level of GRBaV. The viral DNA copy number was determined to be 290+/-89. The original scion wood had the highest level of GRBaV. The viral DNA copy number was determined to be 5,450+/-861. The rootstock adjacent to the graft union had modest GRBaV levels. The viral DNA copy number was determined to be 1,840+/-914. The rootstock distal from the graft union did not have detectable amount of GRBaV. The relative virus level in the green shoot, woody scion, and upper and lower rootstock tissues was 1:19:6:0, respectively. In other words, GRBaV in the green was about 5% of that in the scion wood. GRBaV level in the upper portion of rootstock was 33% that of the scion wood. These results suggest that the CS08 scion wood was infected before grafting. We expect the viral copies in the rootstock and green tissue to increase as the growth continues. This experiment provides valuable insight into the virus level variation within different parts of the same grapevine benchgraft. It serves to guide us in how to take samples to prevent false negative results. For benchgraft like this, we always scrape tissues from both the scion and rootstock portions closest to the graft union. If tissues from distal part of the rootstock were taken for testing, false negative result is likely to occur. Your thoughts, opinions, and observations are much appreciated. Please feel free to call (800)506-9852 or email me if you have any questions. Agri-Analysis provides the most rapid and reliable tests for grapevine leafroll 3 virus (GLRaV-3) and grapevine red blotch virus (GRBaV). Sample request form can be downloaded here. For out-of-state and international growers, please download our USDA inter-state permit or USDA import permit here. For sample collection and shipping supplies (boxes and ziploc bags, etc), please email us. How to Best Sample and Test Green Bench Grafts? That green shoot tissue had a relatively low level of GRBaV. The relative viral DNA copy number was determined to be 290+/-89. Rootstock adjacent to the graft union had modest GRBaV levels. The relative viral DNA copy number was determined to be 1,840+/-914. 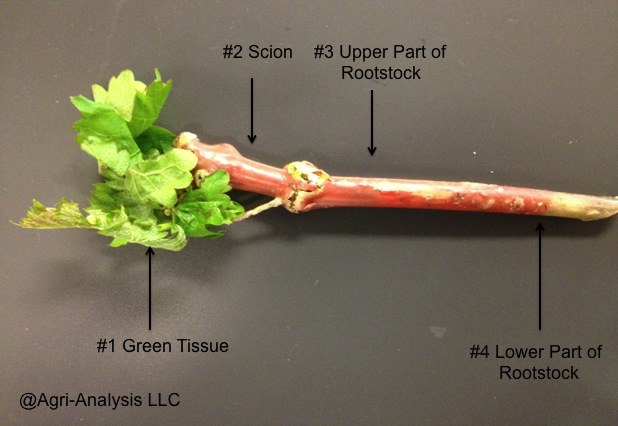 The relative virus level in the green shoot, woody scion, and upper and lower rootstock tissues (Photo, Figure1 ) was 1:19:6:0, respectively. In other words, GRBaV in the green growth is about 5% of that in the scion wood. This result suggests that the CS08 scion wood was infected before grafting. GRBaV level in the upper portion of rootstock was 17% that of the scion wood. As is clear, improper sampling can result in false negative testing results. This study has been instrumental in guiding us to accurately sample and test GRBaV in green grafts in order to avoid false negative results since 2013. The viral copies will undoubtedly increase as the growth continues. Will different rootstock/scion combinations behave differently in terms of how fast the GRBaV virus propagate? In other words, will certain rootstock/scion combinations inhibit GRBaV replication better than others? These are important questions require further research. We would love to hear your experience, thoughts and observations. Thank you. Red blotch virus titer level as a critical parameter to aid in vineyard management decision making? A few years ago in 2013, we found red blotch virus level can vary significantly in infected vines, as high as several orders of magnitude. This data was published in Wine Business Monthly (Wei and Stamp 2013). Three vines are shown in the graph below. They were CS07 on 3916 from the same vineyard. The healthy looking vine (top) had no red blotch. The vine with red speckles (middle) had virus level of 200. The vine with fully red canopy (bottom) had a virus level of 80,000 copies (relative number). Recently, in reviewing this data and in listening to research talks in both Davis and Oregon on how to manage RB infected vineyards, I feel that RB titer level has been a critically missing parameter in their research design. Comparing results of management practices (water, nutrition, canopy thinning, etc) without knowing the relative titer level is like comparing apples and oranges. Perhaps, some vineyards can be maintained for a while if the vines are lowly infected like the vine in the middle. If vines are highly infected like the one in the bottom, perhaps the infection has reached the point of no return. How does the infection reach that point and how do we prevent it for reaching that point are questions that require further research. Before we know the answers to all these questions, it behooves the growers and vineyard managers to know the virus titer level in their infected blocks to make an informed decision. Since virus does not stay still during the growing season, the titer level should be monitored over time to gain information on seasonal variation. Does my virus titer shoot through the roof or stay relatively low level throughout the growing season? Below are comments I received after posting this note on LinkedIn. I have some red blotch infected blocks. Wines from one block was producing award winning wines, while the wines from another were struggling. In discussing with Alan about virus level variation in different vines, we decided to measure the virus titer level in my blocks. We found virus copy number can vary from 500,000 to 20 million copies per gram phloem tissue. The numbers matched our expectations based on foliar symptoms and fruit quality. In areas where we have a small percentage of infected vines with low virus titer, these will need to be rouged. In areas with a high percentage of infected vines with high virus titer, we will pull them right away. All of this is very helpful information to guide us in how to manage RB infected blocks" - SB, Vineyard Owner, Mendocino County. "Do I know about different vines reaction to red blotch! I have a block with CS top grafted to Merlot shows no symptoms. CS only the same rootstock shows obvious visuals signs of red blotch. I am very interested in finding if there if any difference in virus titer level between these vines". JC, Vineyard Owner, Napa. "My thoughts have been that certain variety/ rootstock/soil/mdd combinations are more affected than others. Could the amount of virus measured be a result of the plant materials susceptibility to red blotch? As in certain rootstock/clones express less virus? I am actually working on launching a project soon to get growers to collaborate by sharing their virus, pest and disease information, to get this very answer and others." AW - Vineyard Operations Manager, PCA/QAL, Napa, CA. "We tested vines last year by another lab and were clean This year the same vines tested Red blotch positive by you guys. I feel it was dirty last year, just you guys testing process is a lot better. With you guys test it's more of the level of testing and sensitivity of a test you guys do. This graph is great way to show how you guys differ and how you excel. - SD, Viticulturist, Vineyard, Manager, Newberg, OR. Agri-Analysis encourages our clients with red blotch infected blocks to consider to use virus titer level as a tool to aid in your decision making process. Your thoughts and opinion are much appreciated. Grapevine leafroll associated virus type (GLRaV-)3 is a highly divergent virus and there are currently ten genetic variants known, many are still unknown. Commercial labs generally use published methods for LR3 testing. However, these methods fail to detect all variants in growers samples. When these methods are used in certification programs, they may let LR3 escape detection, resulting in LR3 infected vines in certified materials. In 2013, we realized this was a big problem and developed our own proprietary method for LR3. In developing and testing the new method we included strains that were not even known at the time. The detail of this work was described in Wine Business Monthly: https://www.winebusiness.com/suppliernews/?go=getSupplierNewsArticle&dataId=139271. Our method is the leading industry method for LR3 simply because it captures more variants than any other method. This method has been widely evaluated in CA, Washington, Oregon, Idaho, New York, Australia, Israel, South Africa, Spain, New Zealand, etc. All collaborators report 100% detection of all LR3 variants in their possession. We hope this method will be adopted as industry standard if and when such a standard is established by federal and state agencies, and/or by the industry. Twenty five (25) red blotch positive mother vines were recently discovered at UCD Russell Ranch Foundation Vineyard. The causes for this are multifaceted. Here are some potential technical factors. Third, insufficient sampling and testing protocol may have let the virus escape detection in prior years of testing. For more information, please visit the Wine Business Monthly Article and FPS web site. Regardless of the causes, the presence of red blotch in Russell Ranch serves as a strong reminder for growers to conduct your independent sampling and testing of new planting materials for economically important viruses even though you are purchasing P2010 or certified materials. Agri-Analysis offers the most rapid and the most reliable test for LR3 and red blotch viruses in dormant and green-grafted vines. To submit samples, please download the sample submission form here and send samples to us at Agri-Analysis LLC, 950 West Chiles Rd, Davis, CA 95618. If you have any questions, please call us at 800.506.9852 or email us at info@agri-analysis.com. Agri-Analysis - Grapevine & Seed Testing Since 1981. Agri-Analysis is pleased to exhibit at the Unified Symposium on January 30-31. Please visit us at booth number #2606 to discuss updates on grapevine leafroll and red blotch viruses, USDA TAP program, and sourcing strategies for new planting materials. Agri-Analysis provides grapevine disease testing services to ensure clean planting materials. We help protect your investments. To submit samples for testing, please download the sample form here. For free passes to the Unified exhibition floor, please email us at info@agri-analysis.com with your name, affiliation, address, phone and email address. We look forward to seeing you in Sacramento. More Red Blotch Infected Vines Found in UC Davis Foundation Plant Vineyard. During its annual Grape Advisory Committee meeting on December 4 2018, UC Davis (UCD) Foundation Plant Services (FPS) reported that twenty (21) mother vines were tested positive for grapevine red blotch virus (GRBaV) at its Russell Ranch Foundation Vineyard. This was a sharp increase comparing to the five vines tested positive in 2017. It is believed that this significant increase in GRBaV is due to new infections. However, it is also possible some vines were infected in previous year(s), but did not test positive until this year. For more information, please visit Wine Business Monthly Article and FPS web site. UC Davis Foundation vineyard blocks serve as the source repository for certified, virus-free and true-to-variety clean grapevine plant material distributed to nurseries under the California Department of Agriculture’s (CDFA) Grapevine Registration and Certification (R&C) Program. During its annual Grape Advisory Committee meeting on December 4, UC Davis (UCD) Foundation Plant Services (FPS) reported that twenty (21) mother vines were tested positive for grapevine red blotch virus (GRBaV) at its Russell Ranch Foundation Vineyard. This was in comparison to the five vines tested positive last year. It is believed that this significant increase in GRVaV is due to new infections. However, it is also possible some vines were infected in a previous year, but did not test positive until this year. FPS Foundation vineyard blocks serve as the source repository for certified, virus-free and true-to-variety clean grapevine plant material distributed to nurseries under the California Department of Agriculture’s (CDFA) Grapevine Registration and Certification (R&C) Program. Given this new development, we encourage grape growers to continue their vigilance against viruses even when sourcing for P2010 materials. The following are some good practices excerpted from "Grapevine Nursery Stock: Pathogenic Status of 2018 Planting Season Review" by Alan Wei and James Stamp, Wine Business Monthly, November, 2018. How frequently does nursery test IB’s for viruses? How many materials are Protocol 2010 CDFA certified? The 2017/18 testing, grafting and production season saw the first of Grapevine leafroll-associated virus 3 (GLRaV-3) and Grapevine Pinot Gris Virus (GPGV) in protocol 2010 certified stock. GPGV is vectored by the fairly ubiquitous Erineum mite, which results in the development of characteristic galls on the upper leaf blade. GLRaV-3 is mealybug-vectored and continues to have perhaps the greatest impact on new vineyards planted with contaminated stock. Many nurseries are now using Protocol 2010 CDFA-certified materials in a greater proportion of delivered stock, but the most populat rootstocks and scion clones may still only be available as Classic CDFA-certified-or even as non-certified materials-propagated from commercial vineyards planted to certified stock. Roostock and scion selections that are in high demand and therefore more likely to sell out early-and often only be available as non-certified materials-include Sauvignon Blanc FPS 01, Chardonnay FPS 04, VR O39-16 and 1103P. It is important to read the grapevine purchase sales contract or, if uncertain, seek clarification from the nursery regarding the source of plant material components. Read the full article by Alan Wei Ph.D. and James A. Stamp Ph.D.
A number of growers have reported vine decline problems in their vineyards. In the heat of the summer, leaves would first wilt, then dry and soon the vine would die off. Growers had to take out large blocks of vines or the entire vineyard. We tested the declining vines. They were positive for both grapevine leafroll-associated virus-3 (GLRaV-3) and Phaeomoniella chlamydospora (Pch). By comparison, samples from green and healthy looking vines tested positive for only Pch and negative for GLRaV-3. Pch is one of three fungal pathogens responsible for the Esca/young vine decline complex. These results were consistent among other declining vineyards. Together, they point to a plausible etiology where the vines are already infected with Pch fungi. When GLRaV-3 is brought in by mealybugs, the joint infection by both Pch and GLRaV-3 would cause the vine to decline and eventually die. The role of rootstock, variety, age and other factors remains unclear. However, all samples in these tests were from Freedom rootstock. Photos #1 and #2 below show declining vines and completely dead and dried vines next to each other. Merlot/Freedom (first) and 25-year old CH04/Freedom vines (second) vines are gradually declining. Infected vines were tested positive for both GLRaV-3 and Phaeomoniella chlamydosporum, one of the fungal pathogens responsible for the Esca/young vine decline complex. If you see similar symptoms as shown in photos in your vineyard, please give us a call. During recent years, a number of growers have reported vine decline problems in their vineyards. In the heat of the summer, leaves would first wilt, then dry and soon die off. Photos #1 and #2 show declining vines and completely dead and dried vines next to each other. The declining vines tested positive for both Phaeomoniella chlamydospora (Pch) and grapevine leafroll-associated virus-3 (GLRaV-3). By comparison, samples from green and healthy looking vines tested positive for only Pch and negative for GLRaV-3. Pch is one of three fungal pathogens responsible for the Esca/young vine decline complex. These results were consistent among other declining vineyards. Together, they point to a plausible etiology where the vines are already infected with Pch fungi. When GLRaV-3 is brought in by mealybugs, the joint infection by both Pch and GLRaV-3 would cause the vine to decline and eventually die. The role of rootstock, variety, age and other factors remains unclear. However, all samples in these tests were from Freedom rootstock. Additionally, growers have suspected a new LR3 variants that may be responsible for the decline. To answer this question, we did DNA sequencing analysis of PCR products of the four (4) GLRaV-3 positive samples. All four sequences matched with previously known LR3 in genebank database. These LR3 isolates are not new. These 25-year old CH04/Freedom vines (above) and Merlot/Freedom (below) vines are gradually declining. Infected vines tested positive only for GLRaV-3 and Phaeomoniella chlamydosporum, one of the fungal pathogens responsible for the Esca/young vine decline complex. Agri-Analysis is proud to be a distinguished sponsor of ROOTSTOCK 2018. Redesigned by Napa Valley Grapegrowers (NVG), ROOTSTOCK 2018 is the only event of its kind in the industry focusing on connecting vineyard practices to wine quality. The new ROOTSTOCK will include cutting-edge, educational experiences from the Event Partner booth to top-quality, provocative panel discussions on viticulture & winemaking technology innovation. Please visit NVG Web site for event schedule here. NVG has graciously offered a 25% discount on the General Admission All-Access Pass and General Admission Symposium and Happy Hour tickets to clients and associates of Agri-Analysis. Please register here using the discount code AGA. The exclusive symposium features nearly 50 of the industry's highest quality viticulture and enology companies. It is a must-attend event for wine & grape practitioners. Location: Napa Valley College, 2277 Napa-Vallejo Hwy, Napa, CA 94558. Dr. Wei and Dr. Stamp will report industry update on Grapevine Red Blotch Virus (GRBaV) and Grapevine Leafroll Virus (GLRaV-3) and other grapevine pathogens,symptoms related to infection, management practices and certified grapevine nursery stock selection and options. Agri-Analysis booth is #117. I look forward to seeing you in Napa. Thank you! GLRaV-3 virus is highly diverse and even a single vineyard may contain highly diverse isolates of GLRaV-3. At least eight (8) variant groups (Maree 2015 and Al Rwahnih 2018) are currently known and many more are yet to be identified. This high genetic variability has made it ever more challenging to test and detect GLRaV-3. In 2013, Agri-Analysis developed a new testing method for GLRaV-3 that encompassed the broad variants of GLRaV-3 for detection. At that time, we obtained only partial DNA sequence information of the new LR3 variants. Recently, we did genetic analysis of our partial sequence in comparison with sequences of several new GLRaV-3 variants discovered by FPS. The Agri-Analysis method has been been able to detect these new GLRaV-3 variants since 2013, while other methods have failed to detect them. We believe that inadequate testing method may have led certain LR3 variants escape detection in certification programs, causing LR3 infected vines in certified stocks. We are pleased that Agri-Analysis has been able to detect these new variants of LR3 since five years ago to protect growers. Maree HJ, 2015. Phylogenomic Analysis Reveals Deep Divergence and Recombination in an Economically Important Grapevine Virus, PLoS ONE, 10(5):e0126819. Al Rwahnih M et al, 2018. Molecular characterization of divergent Grapevine leafroll associated virus-3 isolates in California. Proceedings of the 19th Congress of ICVG, Santiago, Chile, April 9-12, 2018, 46-47. Soule MJ et al, 2006. First Report of Grapevine leafroll associated virus-3 in American Vitis spp. Grapevines in Washington State, Plant Dis. 90 (11), p1461. Recently, we were asked to diagnose 25-year old CH04/Freedom vines that are gradually declining and dying infected vines were tested positive for GLRaV-3 and Phaeomoniella chlamydosporum which is one of the fungal pathogens responsible for the Esca/young vine decline complex. Co-infections by GLRaV-3 and Cylindrocarpon or Phaeoacremonium were also found to be responsible for similarly declining vines in other vineyards. Please contact us if you have declining vines as shown in photo below in your vineyards. On a worldwide basis, grapevine leafroll-associated virus 3 (GLRaV-3) is the most prevalent and economically important virus affecting grapevines. 2017-218 season witnessed the most single-year increase in genetic variants being discovered thanks in part to next generation sequencing (NGS). UC Davis Foundation Services (FPS) alone deposited twenty seven (27) near full-length GLRaV-3 genome sequences into GenBank between March and June 2018. GLRaV-3 isolates are highly diverse and even a single vineyard may contain highly diverse isolates of GLRaV-3. At least eight variant groups (Maree 2015 and Al Rwahnih 2018) are currently known and many more are yet to be identified. Their high genetic variability has made testing and detection ever more challenging. In 2013, Agri-Analysis announced that we developed a new testing method for GLRaV-3 that encompassed the broadest isolates/variants of GLRaV-3 for detection. At that time, we obtained the DNA sequence information for the shock protein 70 (HSP-70) region of the genome. When this sequence was blasted against the GenBank database in 2013, only 80% homology was found with a single isolate from Washington State published by Rayapati’s group in 2006 (Soule MJ), suggesting we were working with an unique isolate(s). This year, after the near full-length sequences new GLRaV-3 isolates/variants were made available by FPS, we blasted our sequence again in GenBank. The results are shown in Table below. A total of ten matches were found, of which nine were new isolates discovered by FPS this year and one by Washington State University in 2006. Of the nine FPS isolates, four (4) matched the Agri-Analysis sequence at 99%, three (3) 98%, one (1) 88% and one (1) 80%. This data and analysis suggests since 2013 the Agri-Analysis protocol has been been able to detect these unique GLRaV-3 isolates in vineyard and nursery samples, while other methods may have failed to detect them (Al Rwahnih et al. 2018). We believe that inadequate testing method may have led certain LR3 variants escape detection in certification and other testing programs, causing LR3 infected vines in certified stocks. We are pleased that Agri-Analysis has been able to provide this unique testing method for LR3 since five years ago. Contact Agri-Analysis for more information. A leader in maintaining industry progress, the American Vineyard Foundation (AVF) is a non-profit organization that relies on voluntary industry contributions to support research in viticulture and enology. AVF periodically conducts industry-wide surveys in order to define research priorities. AVF is currently conducting its 2018 Industry Research Priority survey. This is our opportunity to identify and rank top research priorities to help guide AVF project funding going forward. In the May 2018 issue of Wine Business Monthly, industry experts Drs. Alan Wei and James Stamp describe examples of the latest technologies such as bacteriophage, RNAi, nano antibodies, CRISPR and their possible applications to combat grapevine diseases such as Pierce's, Leafroll, fanleaf, powdery mildew and red blotch. Opinions from technical experts such as Walt Mahaffee, Marc Fuchs, Bruce Hammock and industry leaders such as Tony Stephen, Jennifer Putnam, Dan Martinez, Francois Guillaume and John Duarte are provided. These examples and opinions are not intended to be exhaustive, but rather to serve as food for thought as our industry forges ahead with solutions to deal with these ever-changing challenges. We hope that through this type of dialogs the industry can begin to build trust in biotechnology research in order to harness its enormous potential for grapevine improvement. Your comments and feedback are much appreciated. Knowing the Powdery Mildew Spore Count and Possible Fungicide Resistance in Your Vineyard can Help You Make an Informed Management Decision and Make Your Fungal Management Program More Targeted, Sustainable and Cost Effective. Fungicide Resistance of Powdery Mildew. Based on research funded by the American Vineyard Foundation (AVF) in Washington, Oregon and California, over 90% samples tested were found to be resistant to QoI (Fran 11 Strobilurin) and about 60% were resistant to both QOI and DMI (Frac 3 triazoles & imidazoles). The QoI resistance is attributed to a single point glycine to alanine mutation at position 143 of cytochrome b gene (G143A). Determining DMI resistance is much more complex although a change from tyrosine to phenylalanine in the cytochrome 450 protein is known to result in higher DMI fungicide tolerance (Y136F). Detection for Resistance. We use a combination of PCR and DNA sequencing molecular techniques to identify the G143A mutation associated with QoI resistance and the Y136F mutation. For example, the following two DNA sequences were obtained from two powdery mildew samples. One is wild type (#891-1) and another is mutated (#891-3). The wild type is sensitive to QoI treatment and the mutant type is resistant to QoI. Sample Collection. E. necator survives the winter as mycelia infecting tissue inside dormant buds or as chasmothecia or cleistothecia – spore producing fruiting bodies found in bark crevices. On warm winter and spring days when moisture is abundant, chasmothecia burst and release ascospores that stick and germinate on the underside of leaves. This makes chasmothecia as the most important sources of overwintering inoculum in the vineyard. The aforementioned AVF research indicated that the composition of QoI resistant vs sensitive strains is different between spore samples in the air and those on the leaf. To obtain a more comprehensive survey of E. necator spore counts and possible resistance, it is important to take different types of samples from different parts of the vineyard throughout the growing season such as bud samples, leaf samples and air samples. Please call us for more details. We encourage growers to monitor their vineyards for spore counts and possible resistance in order to make an informed decision and to make their fungal management program more targeted, sustainable and cost effective. Please Note: Agri-Analysis is now screen for powdery mildew spore counts and possible fungicide Resistance. Please download a copy of our new sample submission form to send in together with your samples. Thank you. On March 2, Agri-Analysis hosted the first field day of 2018 organized by the Napa Valley Grapegrowers (NVG) Association. Napa growers got a behind-the-scene view of what happens to their vine samples upon reaching the lab, how to sample, how samples are processed, how samples are analyzed, and how to interpret results. The group was lead by NVG associate director Sonya Delucas and Kali Clark. Yolo County Supervisor Don Saylor and Deputy Ag Commissioner David Brown were on hand to greet the Napa visitors. With many Napa grape growers on Yolo soil, Supervisor Saylor proclaimed "Welcome to the Wine Capital of California" - a proclamation that lasted for 3 abut hours. Lab tour was led by Dr. Neda Esteghlal for PCR setup, Andy Zinkl for Elisa setup, Dr. Triatan Eifler for PCR, RT-PCR, qPCR and DNA sequencing data analysis and Dr. Sara Rohkin for sample preparation. "Interactions like this are very important for us to learn growers needs first hand and to answer their questions, it help us better improve our services", said Dr. Alan Wei, general manger of Agri-Analysis. Agri-Analysis is a CDFA approved laboratory located in Davis, CA that tests grapevine samples for viruses, fungal pathogens, Pierce Disease, fungicide resistant powdery mildew etc. With many Napa valley grapegrowers on Yolo soil, Yolo County Supervisor Don Saylor Proclaimed "Welcome to the Wine Capital of California". Grapevine powdery mildew (PM), caused by the fungal pathogen Erysiphe necator, is a major fungal disease in California and all grape growing regions of the world. Currently fungicide applications are the main control methods. In recent years, working with Dr. Walt Mahaffe's group of Oregon State University, Agri-Analysis has optimized testing methods for fungicicde resistant strains of E. necator in vineyard samples, particularly resistance to demethylation inhibitors (DMI) and quinone outside inhibitors (QOI). In a letter to the industry on December 20, 2017, Dr. Deborah Golino, Director of Foundation Plant Services at UCDavis announced that Grapevine red blotch associated virus (GRBaV) has been found in the Russell Ranch* for the first time since its establishment in 2015. Five (5) vines out of 4,132 were tested positive for GRBaV. Dr. Golino believes that because that the three cornered alfalfa tree hopper was found in Russell Ranch, this occurrence of red blotch may be vector mediated. Molecular analysis showed 99% similarity to GRBaV isolates from two different groups, which indicates separate infection events. FPS has removed and destroyed the infected vines and notified a client who received cuttings from these vines. FPS is implementing additional precautions to prevent the spread of the vector and the virus. "We will continue to work to maintain a high testing standard for our foundation vineyards, making every effort to keep you informed", said Dr. Golino in her letter. * Established in 2015, Russell Ranch is maintained by UCDavis Foundation Plant Services as a Foundation vineyard for the California Grapevine Registration and Certification program to supply clean cuttings to nurseries for propagation. All vines planted in Ranch Russell Ranch have met two strict criteria: (a) be generated using microshoot tip tissue culture therapy; and (b) tested negative for more than 37 grapevine viruses. Agri-Analysis is pleased to exhibit at the Unified Symposium at Sacramento Convention Center on January 24-25. Please visit us at booth number #2606 to discuss updates on grapevine leafroll viruses, red blotch virus, and testing requirements under the USDA TAP program. Agri-Analysis provides disease testing services to grape growers and nurseries to ensure clean planting materials. We help protect your investments. If you need free exhibit-only passes to the Unified, please email us at info@agri-analysis.com with your name, affiliation, address, phone and email address. We look forward to seeing you in Sacramento. USDA- FSA is currently still accepting applications for Red Blotch damaged vineyards. Red Blotch is now an accepted cause of loss under the Tree Assistance Program (TAP) in the whole state of California, previously it was only accepted in a few counties. Producers who wish to apply for benefits need to complete eligibility requirements with the County Office for which their vineyard is physically located. Additionally, producers need to sample at least 10 vines per varietal block they will apply for benefits on. Producers have 90 days to apply for benefits after they receive their Red Blotch Test Results. The TAP program has a 12-month expiration date from the date of approval. "A claim of loss due to Grapevine Red Blotch-associated Virus (GRBaV) must be verified through polymerase chain reaction (PCR) testing performed at a commercial laboratory. A minimum of 10 symptomatic vines must be tested from each block claimed to be infected. This sampling, coupled with visual indicators identifiable to the FSA representative will be used to determine the extent of damage. Visual indicators may include, but are not limited to: In red varieties: Reddening of the underside secondary/ tertiary veins, red blotches on leaves. In white varieties: Very pale yellow blotches and irregular chlorosis"
To apply for TAP assistance, please contact your state and county FSA offices. A list of FSA offices is available here. WINES and VINES, July 2015, "Pull Red Blotch Vines, Get Paid"
A number of growers have found black vascular streakings in their bench grafts destined for new planting. When they sent in samples to the laboratory, the black streakings were tested positive for Phaeomoniella, Phaeoacremonium and/or Cylindrocarpon by PCR anaysis. These are three common fungal pathogens that can cause young vine decline and black foot disease. The primary source of inoculum is infected soil, but nursery plants are also a potential infection source. In a survey of 165 non-symptomatic rooted grapevine cuttings selected randomly from various nurseries in California in 2007, 26% tested positive for Cylindrocarpon in PCR assays". For more information, please visit UCANR report and other reports. Symptoms to look for include the following: Please call Agri-analysis for further analysis if you see symptoms like these in your bench grafted planting materials. A number of growers have found black vascular streakings in their bench grafts destined for new planting. When they sent in samples to the laboratory, th black streakings were tested positive for Phaeomoniella, Phaeoacremonium and/or Cylindrocarpon by PCR anaysis. These are three common fungal pathogens that can cause young vine decline and black foot disease. The primary source of inoculum is infected soil, but nursery plants are also a potential infection source. In a survey of 165 non-symptomatic rooted grapevine cuttings selected randomly from various nurseries in California in 2007, 26% tested positive for Cylindrocarpon in PCR assays". For more information, please visit UCANR report and other reports. Symptoms to look for include the following: Please call agri-analysis for further analysis if you see symptoms like these in your bench grafted planting materials. [TAP (REV. 4) CA AMEND 1] "The STC has approved Grapevine Red Blotch-associated Virus (GRBaV), commonly referred to as "Red Blotch", as an eligible plant disease for select counties in California: Amador, Contra Costa, El Dorado, Fresno, Marin, Mendocino, Monterey, Napa, Riverside, Sacramento, San Joaquin, San Luis Obispo, San Mateo, Santa Barbara, Santa Cruz, Solano, Sonoma and Yolo. A claim of loss due to GRBaV must be verified through polymerase chain reaction (PCR) testing performed at a commercial laboratory. A minimum of ten (10) symptomatic vines must be tested from each block claimed to be infected. This sampling, coupled with visual indictors identifiable to the FSA representative, will be used to determine the extent of damage. Visual inspection requirement of claimed infected plants is waived for plants removed prior to September 10, 2014." For more information please contact your county FSA office or Ms Jennifer Blume, FSA, Templeton, CA at Jennifer.Blume@ca.usda.gov. RED BLOTCH TESTING SERVICE BY AGRI-ANALYSIS. As a leader in grapevine virus testing, Agri-Analysis offers the following services for red blotch. Quantitative Testing of GRBaV Titer by Real-Time PCR, aka qPCR. Our research had shown that red blotch disease severity is directly correlated with virus titer in the plant tissue. Virus titer can vary by several orders of magnitude from a slightly symptomatic vine to a heavily symptomatic one. Clade Type Identification. GRBaV is known to exist in two clade types, differing by up to 8% in nucleotide composition. It is unclear wether the two clade types may have different impact on vine health and wine quality. Method optimization to increase sensitivity and broad coverage of variants. Organized Napa Valley Grapegrowers Association, ROOTSTOCK 2106 features high-level, provocative seminars and industry experts, vineyard and wine trials, Concept Bar, networking opportunities, and an exclusive exhibition featuring over 120 of the industry’s leading viticulture and enology companies. ROOTSTOCK connects vineyard practices to the betterment of wine quality. As a PREMIERE PARTNER of ROOTSTOCK 2016. NVG has graciously provided complimentary access to exhibit halls and a 10% discount to attend seminars for clients and associates of Agri-Analysis. To register online, please visit the link below and use the discount code: AGA. Here, we would like to re-post an early study where we correlated the intensity of leaf symptoms with red blotch virus tier level. Sample #1. Normal and green foliage: No RBaV was detected by conventional PCR the relative DNA copy number of RBaV was zero by quantitative PCR (qPCR). Sample #2. Speckled red foliage: RBaV was positive by conventional PCR; the relative DNA copy number of RBaV = 200+/- by qPCR. Sample #3. Complete red foliage: RBaV was strongly positive by conventional PCR. the relative DNA copy number of RBaV = 80,000+/- by qPCR. Attached is the current information for TAP kindly provided by Jennifer Blume of County Executive Director, San Luis Obispo County FSA Office, 65 S. Main St Suite # 106, Templeton, CA 93465, (805)434-0396 Ext 2. The web page is listed on the back of the flyer, www.fsa.usda.gov. Growers could find the FSA office in their county in California and the contact information. What is TAP? TAP is administered by the Farm Service Agency of the USDA. Under the Farm Bill of 2014, when a crop is affected by a natural disaster, the Tree Assistance Program (TAP) can provide financial assistance to qualifying orchardists and tree growers to replant or rehabilitate eligible trees, bushes or vines. Eligible trees, bushes and vines are those from which an annual crop is produced for commercial purposes. Eligibility. To qualify, participants must have suffered a qualifying loss in excess of 18% mortality from an eligible disaster for an individual stand. Participants must turn in evidence of eligible disaster. For Red Blotch, a minimum of 10 symptomatic vines from each block must be verified through polymerase chain reaction (PCR) testing performed at a commercial laboratory. Participants must have owned the eligible trees or possess long term lease agreements. "We have experienced a significant amount of Red Blotch infection in our vineyard near Jacksonville, OR. We have tracked the spread of the virus both through testing and mapping of symptoms. In the fall of 2015 we removed all symptomatic vines as well as many adjacent asymptomatic vines in an attempt to prevent the spread of this virus to uninfected portions of the vineyard. Out of 21.25 acres, 5.5 acres were removed. This was in addition to 0.9 acres that were removed in the fall of 2013 and replanted in the spring of 2014. Test results from a large sample grid showed that the occurrence of symptoms in 2015 corresponded to the presence of the virus at detectable levels. The symptomatic (and subsequently removed) portion of the vineyard was generally concentrated along the eastern edge of the vineyard, with symptoms and positive test results diminishing towards the west. As far as it was detectable through either testing or visual symptoms, there were no "infected" vines remaining in the vineyard as of spring 2016. As of this morning (September 2), the extent of symptoms is so severe and wide-spread throughout the vineyard that there seems to be no significant unaffected portion. Were we to remove plants under the same guidelines that we applied in 2015 there would likely be fewer than 2 acres of the 21.25 remaining. The onset of the symptoms appears to have occurred both rapidly and quite recently." "My best guess is that most of this spread occurred prior to the 2016 season and remained below detection or symptom inducing thresholds. The grid testing that was done in 2014 and 2015 was recently repeated so there will soon be new test results to show any newly detectable infection. As for this year, I believe there was some (scant) evidence of tree-hopper activity observed in the vineyard but it should be noted that the vineyard was treated with a drip-applied neonicotinoid at the beginning of May and few hoppers of any type (and zero three-cornered alfalfa hoppers) were found despite frequent sampling by the local extension team. " A claim of loss due to GRBaV must be verified through polymerase chain reaction (PCR) testing performed at a commercial laboratory. A claim of loss due to GRBaV must be verified through polymerase chain reaction (PCR) testing performed at a commercial laboratory. A minimum of ten (10) symptomatic vines must be tested from each block claimed to be infected. This sampling, coupled with visual indicators identifiable to the FSA representative, will be used to determine the extent of damage. 2. Grapevine red blotch-associated virus is Present in Free-Living Vitis spp. Proximal to Cultivated Grapevines. by Perry KL, McLane H, Hyder MZ, Dangl GS, Thompson JR, Fuchs MF. Phytopathology. 2016 Jun;106(6):663-70. 3. Grapevine Red Blotch-Associated Virus, an Emerging Threat to the Grapevine Industry. by Sudarshana MR, Perry KL, Fuchs MF. Phytopathology. 2015 Jul;105(7):1026-32. Review. 4. Subcellular localization of grapevine red blotch-associated virus ORFs V2 and V3. Guo TW, Vimalesvaran D, Thompson JR, Perry KL, Krenz B. Virus Genes. 2015 Aug;51(1):156-8. doi: 10.1007/s11262-015-1205-x. Epub 2015 Jun 11. 5. Grapevine red blotch-associated virus Is Widespread in the United States. by Krenz B, Thompson JR, McLane HL, Fuchs M, Perry KL. Phytopathology. 2014 Nov;104(11):1232-40. Vineyard-Specific Research. We have assisted growers in conducting vineyard-specific research to survey for the extent of the GRBaV virus and to monitor its spatial and temporal spread throughout the seasons, to assist in wine quality assessment and decision making. Vineyard Visits. We work with your team of vineyard managers, viticulturists, and consultants to assist in your new planting and planning process. University Research. Agri-Analysis is proud to provide ongoing testing services to support research projects led by farmer advisors, extension specialists and key researchers. Much research is needed to understand GRBaV, its effect, transmission and management. Please feel free to contact me if you have any questions or would like to share your observations and good practices. Confidentiality Statement: Information contained in this communication is confidential and proprietary to Agri-Analyis LLC intended for the designated recipient only, and shall not be forwarded or otherwise disclosed to any third party without the written consent of the sender. If you received this message in error, please contact Agri-Analysis LLC at (800)506-9852 or info@agri-analysis.com. Thank you for your cooperation. Grapevine leafroll associated virus 3 (GLaV-3) is, arguably, the No. 1 most economically important virus in grapevine production and is designated as an exclusion pest in most certification programs. However, growers are often frustrated to find this virus in their vineyards and in certified nursery stocks. GLRaV-3 is known to be genetically highly variable. Such genetic variability can have significant implications in the detection of GLRaV-3 by molecular means and serological assays. Since 2013, Agri-Analysis has developed a proprietary ELISA-based reagent that provides broader coverage of GLRa-V3 variants than the commercial reagent currently in use. The figure below is a set of data comparing the testing results of ten samples. One sample was tested positive for GLRaV-3 by both methods (left). Seven samples were first tested using cane samples (AA1, green) and re-tested using petiole samples (AA2, light green). The GLRaV-3 strain in these samples can only be detected by Agri-Analysis reagent but not by the Bioreba reagent. Two control samples were tested negative for GLRaV-3 by both methods. Sequencing analysis shows 80-85% homology in nucleotide sequence and 90-93% amino acid sequence with other known GLRaV-3 variants in gene bank. Because of these variablity, genetic based method such as PCR and qPCR using known primers fail to detect this variant(s). Currently, the new reagent is being used in California and Washington State Certification programs. We would like to share the latest incidence rate of red blotch based on all samples tested at Agri-Analysis during the past year. The graph below shows the monthly average percent of samples tested positive for GRBaV and GLRaV-3 among all samples submitted to Agri-Analysis for testing from April 2015 to March 2016. The highest incidence occurs in later summer and fall when growers sent in sympomatic samples for testing. The percentage of GRBaV and GLRaV-3 positive samples was as high as 70% and 40% respectively. In the spring, growers test large amount of dormant vines and grafted vines which do do not exhibit any symptoms. The percentage of GRBaV and GLRaV-3 positive samples was relatively lower, but GRBaV incidence still varied between 5% to 20% between January and March of 2016. Overall, for the 12-month period reported, the average positive rate was 20% and 10% for GRBaV and GLRaV-3, respectively, among all smaples tested at agri-analysis. Please feel free to email us at info@agri-analysis.com or call us at (800)506-9852 if you have any questions. Thank you. Powdery mildew is a fungal disease that affects a wide range of crops including grapevines. The specific fungus that causes powdery mildew on grapes is Uncinula necator, causing grape growers millions of dollars annually. Dr. Walt Mahaffee’s research group of USDA-ARS at Oregon State University has demonstrated that growers could accurately quantitate grape powdery mildew spore level and make management decisions guided by inoculum density results derived by quantitative polymerase chain reaction (qPCR). Using the qPCR data, some growers were able to reduce fungicide applications by up to two sprays without increasing disease on leaves or fruit. As a CDFA approved testing labortory (permit # 057-11), Agri-Analyis uses polymerase chain reaction (PCR) to test grapevine red blotch associated virus (GRBaV) to help growers qualify for the USDA Tree Assistance Program (TAP). TAP provides financial assistance to eligible growers to replant or rehabilitate eligible trees, bushes and vines lost by natural disasters. Eligible trees, bushes, and vines are those from which an annual crop is produced for commercial purposes. A minimum of ten (10) symptomatric vines must be tested from each block claimed to be infected. This sampling, coupled with visual indicators identifiable to the FSA representative, will be used to determine the extent of damage. For more information on Farm Service Agency (FSA) disaster programs, visit http://disaster.fsa.usda.gov or visit your local FSA county office. Visit to find your local FSA county office. If you have any questions about sampling and testing, please email us at info@agri-analysis.com or call us at (800)506-9852. WiVi Central Coast, is the premier wine and viticulture symposium and trade show in Central California. Now the largest wine industry event south of San Francisco, WiVi boasts 45,000 sq. ft. of exhibit space with nearly 200 exhibits and hundreds of new products, product demonstrations, educational seminars and networking opportunities for winemakers, grape growers, winery owners and managers. The day-and-a-half conference and one-day tradeshow features concurrent sessions by top industry leaders on regional viticulture, enology and DTC topics and gives attendees the opportunity to understand and experience new trends and technology. Interest in, and concern about, the disease known as Red Blotch has taken California by storm. It was originally thought to be a relatively new disease but recent research indicates that it may have been in California for many, many years. There have been major advances in the detection of the disease and important discoveries on how it spreads. New information is being revealed continuously and this presentation from the leading Red Blotch expert will update you on the latest findings. On Wednesday, March 2, 2016, Dr. Alan Wei was honored to have shared the stage with a distinquished panel of wine makers and viticulturist at the Wine Business IQ at Tasting Session: Effects of Red Blotch on Wine Quality. During the Regional IPM Centers' multi-speaker webinar on red blotch disease, organized by regional IPM centers last Friday, UCD and USDA-ARS Researchers Dr. Brian Bahder, Dr. Mysore "Sudhi" Sudarshana and Dr. Frank Zalom reported their discovery of three-cornered alfalfa treehopper (ATH), scientific name: Spissistilus festinus) as a likely vector to transmit red blotch associated virus (GRBaV). In their experiments, they selected four candidate groups: one treehopper (20 insects), two leafhoppers (70 insects), one jumping plant lice (10 insects), and one planthopper (10 insects). Insects were allowed to feed on virus infected grapevines and released individually onto virus-free grapevines. At a 5-month test under green house conditions, three of the 15 plants exposed to three-cornered alfalfa tree hoppers (ATH) became positive for GRBaV. Insects from other groups did not show any transmission although some of them did acquire GRBaV in their system when fed on infected vines. 1. Is ATH the only vector to transmit GRBaV or there are other insects involved? 2. What is the distribution and prevalence rate of ATH in California vineyards and other major wine growing regions of the U.S.? 3. Is ATH responsible for the spread of RB in California vineyards? or lack thereof in other states and other countries? 4. Does ATH transmit other viruses besides red blotch? 5. What should growers do to manage ATH in their vineyards? For other important update on red blotch from other speakers, please visit the recording of this webinar is at Youtube. Innovation + Quality (IQ) 2016 is the second annual forum for ultra-premium wineries focused on cutting-edge innovations that advance wine quality. This day-long event will take place March 2, 2016 at Charles Krug Winery in Napa Valley. Each year, the pest & disease pressures we face in our vineyards continues to increase, and it is suggested that the recent warm growing seasons and drought conditions have contributed to a reemergence of Pierce’s Disease and an increase in Powdery Mildew and grapevine trunk diseases in Napa vineyards. If you have challenges with any of these diseases, this is one session you don’t want to miss. The following multi-speaker Webinar invitation kindly provided by Dr. Frank Zalom of UC Davs and Dr. Mysore Sudarshana of UCD-USDA ARS. I hope you will be able to attend this important update on red blotch research. "Grapevine red blotch disease and the virus associated with it has been confirmed in many major grape production regions of the United States and Canada. Since the identification of the virus in 2011, several teams of researchers from across North America have been intensely characterizing the disease and effects on grapevines, as well as characterizing the virus, its spread, and potential management. Considerable progress has been made, but much remains unknown. Speakers representing many of these labs will be presenting their work and what it means for the grape industry." If you need more information about the webinar, please contact Frank Zalom at fgzalom@ucdavis.edu . New Webinar on Red Blotch: UCDavis and Cornell Researchers have announced a joint webinar on Feburary 26 at 10:00 AM PST to update the community on latest research results on red blotch. There will be about nine speakers and the agenda and registration link will be released shortly. Once it's available, it will be posted here. TAP Assistance Approved in Oregon: USDA approved Oregon for assistance in replanting red blotch infected vineyards. For more information, please contact teresa.vonn@or.usda.gov. The testing requirement in California is 10 infected plants per block. We are still waiting from USDA Oregon office on specific testing requirements. "Grapevine Pinot gris virus (GPGV) was first identified in grapevine cv. Pinot gris in Northern Italy in 2012. It has not been reported in the U.S. until recently. Al Rwhanih et al (2015) surveyed foundation plant collections at the University of California, Davis. Out of 2014 plants surveyed, they found GPGV in one vine of a rare collection cv. Touriga nacional. Here we report the finding of GPGV in cvs. 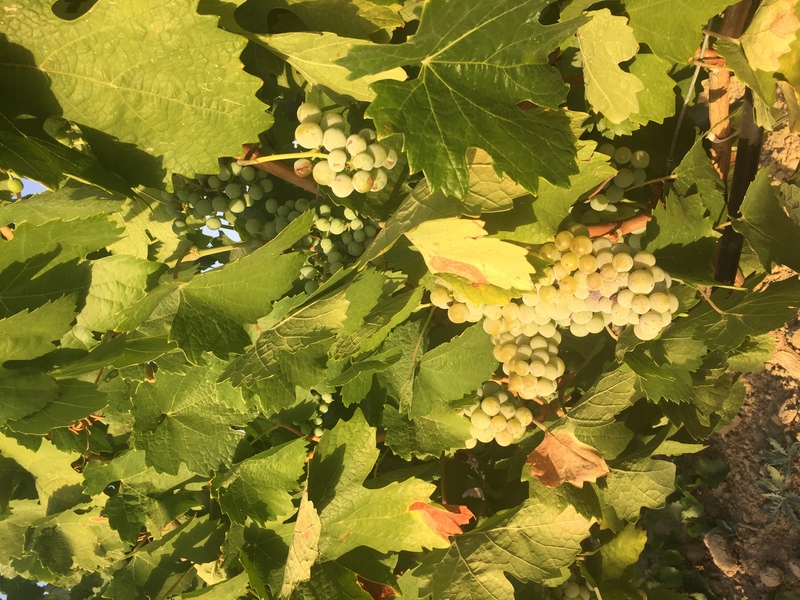 Chardonnay, Cabernet Sauvignon and Cabernet franc - grapevine varieties most commonly cultivated in commercial vineyards in the U.S. Further studies are required to assess its prevalence rate and economical impact on vine productivity and grape quality." For more info, please visit APS web site at http://apsjournals.apsnet.org/doi/abs/10.1094/PDIS-01-16-0055-PDN. Agri-analyis has been testing for GPGV since October, we regularly find GPGV in California grapevine materials. Please contact us info@agri-analysis.com if you are interested in testing GPGV. A grapevine virus discovered in 2012 by Italian researchers using next generation sequencing (NGS) as grapevine Pinot Gris virus (GPGV) and associated with disease symptoms in Pinot Gris in northern Italy since 2003, was recently detected in California grapevines in Napa Valley. Discovered by Italian researchers in 2012 by NGS, although symptoms were noted as early as in 2003 in Northern Italy. GPGV has been detected in Slovenia, Slovakia, Czech Republic, Greece, France, Turkey, Croatia, Serbia, Montenegro, Bosnia, Macedonia, Ukraine, Romania, Spain Portugal as well as in China (2015) and Korea (2013), and now in U.S.
Trentino region in Italy showed widespread distribution of GPGV which is associated with symptomatic (79%) as well as symptomless vines (21%). Since October of 2015, Agri-Analyis has found and confirmed presence of GPGV in Chardonnay, Cabernet Franc and Cabernet Sauvignon in four US Vineyards in Napa valley . (manuscript pending peer review). A PCR test is available at Agri-Analysis. Red Blotch Presentations and Free Tickets to Rootstock Nov 12. Title: Importance of Independent Evaluation of Certified Planting Materials. Grapevine Red Blotch associated virus and leafroll virus type 3 are most frequently found in certified stock. Other exclusion viruses are also found. To-date fan leaf virus has not been found in certified stock. With the recent outbreak of Pierce’s Disease in many parts of the North Bay and ongoing problems with fungal induced trunk diseases such as Eutypa and Bot canker, it is crucial to independently evaluate propagation source materials for their cleanliness in order to avoid costly replanting. We will report on findings from propagation and vine evaluations during the 2015 growing season and comment on trends and recent observations. Many growers have called to ask for testing requirements in order to qualify for USDA Assistance under the TAP program. The following is excerpted form the USDA guideline: "A claim of loss due to Grapevine Red Blotch-associated Virus (GRBaV) must be verified through polymerase chain reaction (PCR) testing performed at a commercial laboratory. To apply for assistance, please contact your state and county FSA offices. A list of FSA offices is available here. For testing, please download a sample submission form and send it together with your samples to Agri-Analysis, 950 West Chiles Road, Davis, CA 95618. Agri-Analysis has developed a new reagent that can detect broader leafroll 3 variants than the current commercial reagent for leafroll 3 (BIOREBA). The new reagent is being used by state certification programs, universities in several countries including Australia, New Zealand, France, Israel and Spain in their testing and monitoring of GLRaV-3 in vineyards and nursery stocks. To read more detail, please visit Wine Industry Network or download a copy of our news release. We request that you ship samples to this new location together with a copy of the sample submission form. If you have shipped to the old location, we are still able to receive them. Our phone numbers and email address remain the same. Please be assured that testing is on-going without interruption and your samples are processed with the rapid turnaround that you have always expected of us. We are very excited about the move back to Davis. Our new location is on the UCD bike path with a beautiful environmental envelope bordering Putah Creek and UCD facilities. It takes 3 min by bike and 10 min by walk to get to Campus center. It is easily accessible from Richard Blvd South exit and Research Park Drive (map below). Ready access to campus resources would undoubtedly help enhance our capacity to better serve you. Please do not hesitate to stop by to visit us when you are in the Davis area. Please contact me if you have any questions or need any more information. Leafroll infection in red cultivars has been traditionally known to be manifested by green veins and red leaves. With the emergence of red blotch, symptom-based diagnosis has become more challenging. Here we would like to share a couple of photos of Pinot Noir 777 on 3309 from a vineyard in southern Oregon. Photo 2. Pinot Noir 777 on 3309 from Southern Oregon planted in 2014, tested positive for LR3but negative for red blotch. Referring to the challenges of visual based diagnostics, Dr. Mark Fuchs of Cornell University commented to Oregon growers that "welcome to the world of confused people." For accurate diagnosis of your vineyard condition, please call Agri-Analysis at (800)506-9852 or email us at info@agri-analysis.com. Many growers have called to ask for testing requirements in order to qualify for USDA Assistance under the TAP program. The follwoing is exerpted form the USDA guideline: "A claim of loss due to Grapevine Red Blotch-associated Virus (GRBaV) must be verified through polymerase chain reaction (PCR) testing performed at a commercial laboratory. In white varieties: Very pale yellow blotches and irregular chlorosis"
For testing, please download a sample submission form and send it together with your samples to Agri-Analysis, 930 Riverside Parkway, Suite #30, West Sacramento, CA 95605. Please call (800)506-9852 or email info@agri-analysis.com if you have any questions. 1301 Redwood Way, Ste. 190 . 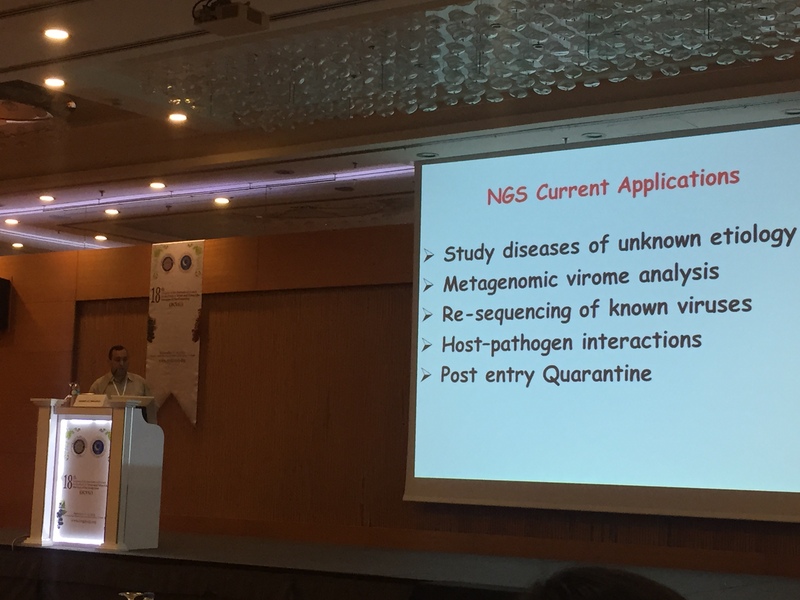 I had the great pleasure of attending the 18th International congress on viruses of the grapevine (ICVG) held on September 7-11 in Ankara, Turkey. Every three years, ICVG brings together the world's best and brightest minds to report on the cutting-edge research on grapevine viruses and associated diseases. 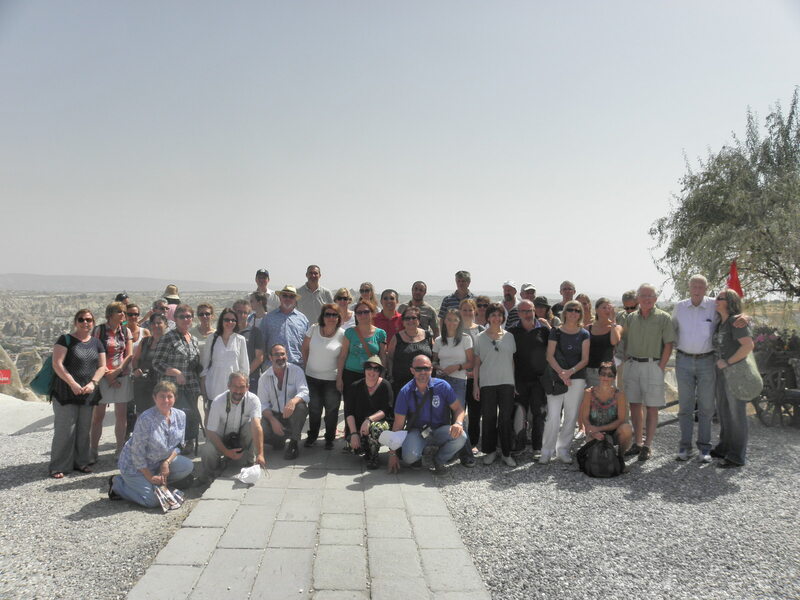 Last time when ICVG met in Davis in 2012, the discovery of red blotch virus was announced. 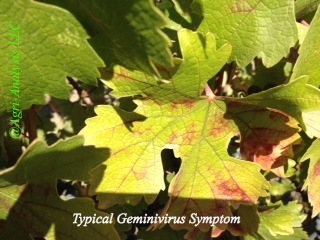 No new virus has received more attention by California growers than the grapevine red blotch virus. 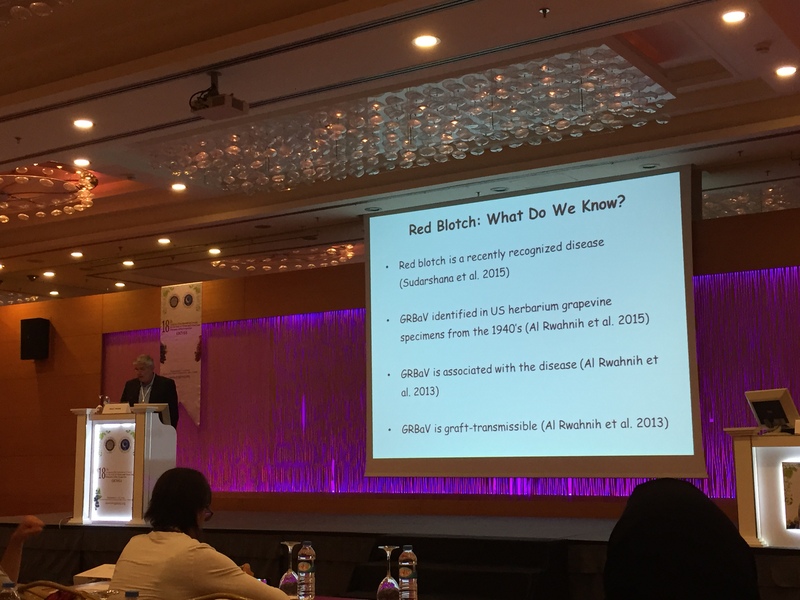 Hereby I would like to provide you with an update on red blotch research from the 18th ICVG summarized to the right column. Please feel free to contact me for any further details. In addition to red blotch, advances in new technology such as next generation sequencing have enabled the discovery of other new viruses. Some examples are as follows. Although grapevine pinot gris virus (GPGV) was reported in 2012 by Italian researchers,it is not until recently that the association of this virus with a disease starts to emerge. It s related to an emergent pathology characterized by stunting, leaf deformation, chlorotic mottling and mosaic. GPGV is now found in most wine growing regions of Europe. To the best of our knowledge, no discovery of GPGV has been reported in North America. To this end, we continue to encourage growers to be vigilant to survey existing vineyards so as to remove an infected vines and to test new planting materials so as to prevent any infected vines from being planted in new vineyards. Please contact us for further details at info@agri-analysis.com or (800)506-9852. Red Blotch Research Update from Dr. Marc Fuchs of Cornell University. In one survey, GRBaV isolates from free-living vines fall within clade 2, as do the majority of isolates from adjoining vineyard blocks. This suggests that free-living grapes have the potential to serve as reservoirs of GRBaV. 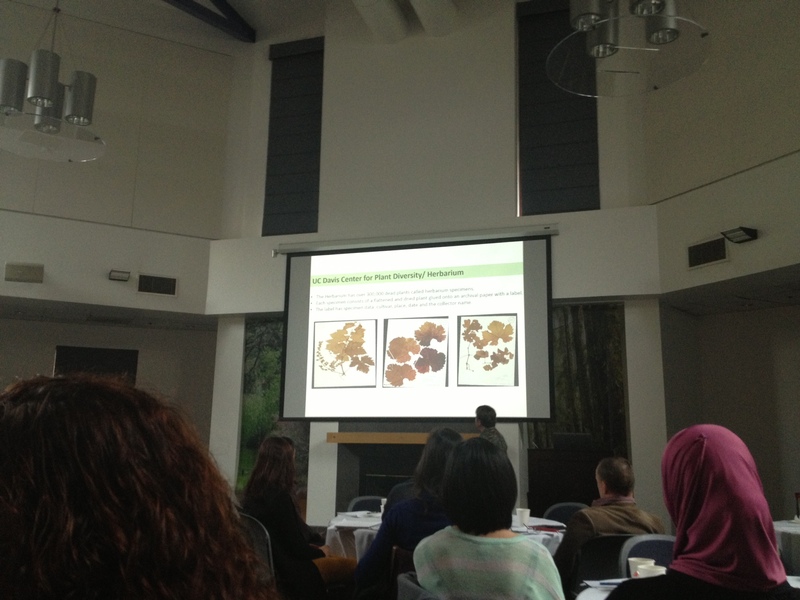 Red Blotch Research Update from Dr. Naidu Rayapati of Washington State University. Among the 82% samples with single infections, 71% and 29% samples were positive for GLRaV-3 and GRBaV respectively. Red Blotch Research Update from Dr. Jean-Sebastien Reynard of Switzerland. Photos from 18th ICVG September 7-11. Turkish Emir white grape in central Anatolia region. 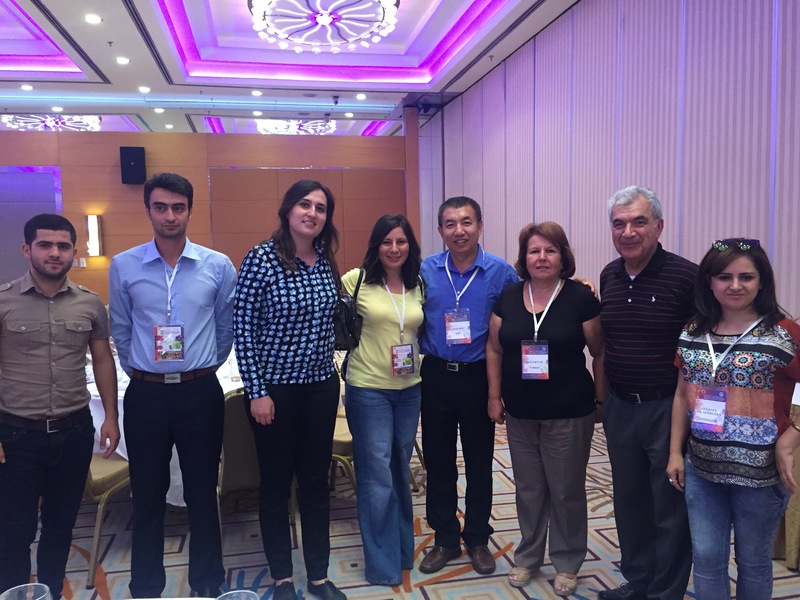 Photo with Professor Filiz Ertunc (3rd right) and her students of University of Ankara and Dr. Nuredin Habili of University of Adelaide Australia (2nd right). For further details, please visit http://icvg2015.org/. Agri-Analysis has developed a new reagent that can detect broader leafroll 3 variants than the current commercial reagent for leafroll 3 (BIOREBA). The new reagent is being used by state certification programs, universities in several countries including Australia, New Zealand, France, Israel in their testing and monitoring of GLRaV-3 in vineyards and nursery stocks. To read more detail, please visit Wine Industry Network or download a copy of our news release. An article by James Stamp and Alan Wei, Wine Business Monthly, August, 2014. This article may be downloaded from any of the sources below. BROCHURES AND LITERATURE ON GRAPEVINE RED BLOTCH VIRUS. "The Impact of Grapevine Red Blotch Virus" by Stamp and Wei in March, 2013 WINE BUSINESS MONTHY. With publisher's permission. Agri-Analysis is a proud contributor to the American Vineyard Foundation and to UC Davis for grapevine red blotch research. Please contact S cott at AVF, Michael Sipiora or Bob Steinhauer. We would like to report the status of red blotch and leafroll 3 viruses in California vineyards. The graph below shows the percentage of positive samples in all samples tested at Agri-Analysis for past three consecutive growing seasons. This set data represents results from a large number of grapevines from various sources including existing vineyards and new planting materials. We can see that red blotch virus has taken over leafroll 3 as the #1 most economically important grapevine virus. During the past three planting seasons, the infection rate of red blotch virus varied between about 15% to 25% while the infection rate of leafroll 3 virus hoovers around 10%. These results are significant due to the large numbers of samples tested. We continue to encourage growers to be vigorous to test new planting materials so as to prevent any infected vines from being planted in new vineyards. Please contact us for further details at info@agri-analysis.com or (800)506-9852. Thank you. Grape Growers have reported more incidences of PD this spring than in past years. Pierce's disease is caused by the infection of pathogenic bacterium Xylella fastidiosa. Unlike viruses that are limited in the phelom tissues, Xf is limited in xylem tissues and unevenly distributed. When sampling for PD, please be sure to include this year green shoot as well as lignified canes from previous year. Agri-analysis uses both ElIsa and PCR to ensure accuracy of the results at no additional cost to growers. Thanks for choosing Agri-Analysis, We Help Protect Your Investment, since 1981. Symptoms of Red Blotch. Click image for full size. The California Grapevine Registration & Certification Program, administered by CDFA, aims to eliminate specific grapevine diseases such as leafroll, fanleaf, corky bark, stem-pitting and fleck that are spread from vine to vine by grafting and/or vegetative propagation1. However, for many years, grape growers have been frustrated by the fact that CDFA certified grapevine nursery stock available from participating California grapevine nurseries are often found to be contaminated by these regulated viruses2-3. The Grapevine Red Blotch associated Virus (GRBaV), described in fall of 2012 as the cause of leaf reddening and retarded ripening in wine grapes, helped growers to re-focus on the issue of cleanliness of their planting materials. 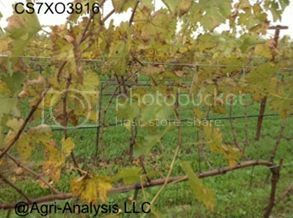 The availability of a PCR based diagnostic test for GRBaV confirmed that red blotch was widespread in both scions and rootstocks of CDFA certified grapevine nursery stocks. This led to the cancellation of shipment of unprecedented number of vines from California grapevine nurseries to vineyard sites all over the U.S.
Over the years, we have conducted field observations and laboratory testing of certified scion increase blocks which are the source of CDFA certified budwood for grafting. Increase blocks of important budwood clones were found to be contaminated with leafroll virus 3 and/or GRBaV. We also found that finishing dormant plantings in CDFA certified nursery rows were contaminated with LR3 and/or GRBaV. While previously ordered nursery stock was cancelled because of LR3 and GRBaV contamination, growers still had to plant vines due to legal and economical considerations. This led to a scramble to search/re-search and test/re-test copious volumes of scion and rootstock materials in order to find clean grafting stock. Through this process grape growers came to the painful realization that CDFA certified nursery stock could not provide them with clean grapevines free of economically important viruses (EIV), which was contrary to what they had expected. Since spring 2014 an ad hoc committee of concerned growers and vine specialists was formed. The committee met regularly at Caldwell Vineyard in Napa with the goal of promoting changes in the CDFA regulation. Meetings were also held with CDFA, FPS and nurseries. As a result of these activities, a public meeting was held in Sacramento in December 2014 where Joshua Kress, program manager of the CDFA’s nursery certification program, presented current requirements for testing, inspection, eligibility and traceability on foundation blocks, increase blocks and certified nursery plantings. Revision to the CDFA grapevine nursery certification program should include addition of GRBaV as a regulated pathogen and address defects in protocol that do not provide sufficient protection against easily vectored viruses. For example, the program currently calls for testing of key viruses every five years. Given the widespread occurrence of mealybug, vectors of Leafroll 3 virus, the sampling frequency should be increased from every five years to every year. In addition, the program’s current sampling protocol for in-field increase block vines and finishing nursery stock is poorly defined and inadequate to provide statistically confident results. Furthermore, the current program calls for visual inspection of all CDFA rootstock and scion increase blocks at least once a year. This is a critical step in securing clean material as visual evaluation of vines in fall can readily identify the presence of disease. However, this is not a job for the untrained, and requires inspection of every vine at precisely the right time when symptoms are present. Top-work should not be allowed in the program. One of the biggest hurdles to development of an effective system is available funding. It is imperative that the public search out the CDFA to comment on the existing program and that key industry stakeholders (e.g., growers, nurseries, FPS and CDFA) work together to develop an effective and transparent program, which will lay the foundation of clean grapevine planting stock for years to come. and Alan Wei, Ph.D., Agri-Analysis, LLC, West Sacramento, CA. “We have had at least one other sample from another vineyard that yielded positive results with the Agri-Analysis reagent but negative for the BioReba." Since we reported the discovery of new LR3 testing reagent developed by Agri-Analysis last summer, we have received many inquries from US and other parts of the world. Some colleagues have spent time to evaluate and report results back to us. Here I would like to share some comments and/or results. To our knowledge, the reagent is now being used by California and Washington State grapevine certification programs. As growers prepare for the busy planting season, it is important to screen viruses status of new planting materials regardless of their source and origin. Last August, Stamp and Wei reported the virus status of CDFA-certified grapevine nursery blocks based on our combined experience of testing tens of thousands of plants from various sources. In that article, several growers also expressed their frustration over the fact that economically important viruses such as LR3 and red blotch are frequently found in CDFA certified planting materials. The Canadian national inspection agency also reported high incidence of virus levels in grapevine materials imported from California certified sources. I will look forward to seeing you to catch up on these and other exciting happenings in our industry. Agri-Analysis will exhibit at Booth #225 together with Advanced Viticulture Inc. I look forward to seeing you at the conference. Thank you! We have a few extra exhibit hall only passes. If you need them, please email us with your name and email and affiliation, we will register you. Also, you are cordially invited to join us at the Capitol Garage for a happy hour/dinner. Please RSVP here. As reported earlier, Agri-Analysis has developed a new reagent that can detect broader leafroll 3 variants than the current commercial reagent (BIOREBA). Two state certification programs are now using the new reagent in their testing and monitoring of GLRaV-3 in vineyards and nursery stocks. Colleagues from Australia, France and Israel also ordered the reagents in their testing. To read more detail, please visit Wine Industry Network or download a copy of our news release. NCPN Meeting for Grapes to be Held on January 30 in Davis. The National Clean Plant Network for Grapes was established in 2008 for the purpose of efficiently producing, maintaining and distributing healthy grapevine plant material to all aspects of the grape industry, including table, wine, juice, raisin and rootstock grape producers and consumers. The NCPN for Grapes supports clean plant centers and provides education and outreach services in support of its mission. For more information, please visit NCPN web site. Please visit the UCD Extension web site for Registration and contact information. The First Public Hearing on Grapevine Certification Program was held on December 18 in Sacramento. Joshua Kress, Program Supervisor at CDFA, presented current requirements of testing, inspection, eligibility and traceability on foundation blocks, Increase blocks and certified nursery plantings. Some of participants comments can be found on Wine Business Monthly web site. In today's FPS Annual Meeting, Dr. Deborah Golino, director of Foundation Plant Services (FPS) at UC Davis, reported their research survey results of 56 dry leaf samples in the Davis Herbarium from 1937 to 1950. One out of 56 samples was found to be positive for red blotch gene. Further genetic analysis showed 99% homology with red blotch virus genome recently reported by several research groups. The leaf sample was from Early Burgundy collected by Dr. Harold Olmo in Sonoma county in 1940. Funded by a USDA Small Business Innovative Research (SBIR) grant, Agri-Analysis has developed a new reagent that can detect broader leafroll 3 variants than the current commercial reagent (BIOREBA). Two state certification programs are using the new reagent in their testing and monitoring of GLRaV-3 in vineyards and nursery stocks. To read more detail, please visit Wine Industry Network or download a copy of our news release. The Wine Industry Network has graciously provided complimentary Trade Show Floor Only tickets to clients and associates of Agri-Analysis. I would like to cordially invite you to please visit the WIN North Coast Expo web site to review the program and to register for you and your associates. When you register, please use the discount code AGR441. Agri-Analysis booth number is #441. I look forward to seeing you at the conference. Thank you! An article by Fritz Westover and Kris Beal provides a practical guide for installing and interpreting information from soil moisture monitoring technologies in vineyards. This is a Vineyard Team Publication that can be downloaded. For more information, please visit UCANR web site. Please visit the UCD Extension for Registration and contact information. Title: "Virus Status of CDFA-Certified Grapevine Nursery Stock: Current Perspectives and Protocol 2010"
Time and Place: 12:30 pm Thursday, November 13, Napa Exposition Fairgrounds, 575 Third Street, Napa, CA 94558. Napa Valley Grape Growers Rootstock Conference. 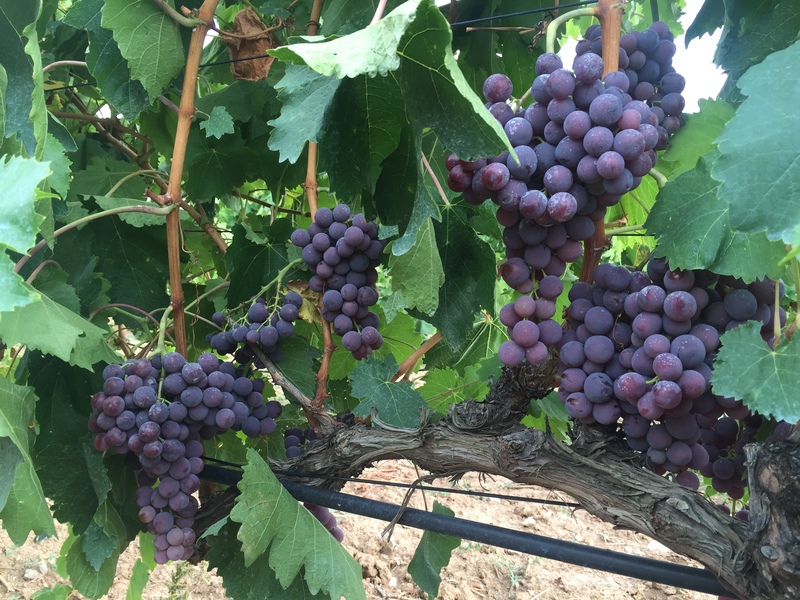 Synopsis: Grapevine red blotch virus (GRBaV) and leafroll associated virus 3 (GLaV-3) are the most economically important viruses in grapevine production and are designated as exclusion pests in most grapevine certification programs. Growers, however, are often frustrated to find GRBaV and GLaV-3 in their vineyards and in certified nursery stock. During recent months there has been intense discussion among key California stakeholders as to why these viruses are found in certified materials and how to rectify this situation. Last week, CDFA announced the review of grapevine certification program. In this presentation, we would like share our views and experience on this important issue facing our industry. We believe these are technical challenges that require science based solutions. In addition to the development of better diagnostic tools for use by certification programs, nurseries and growers, the availability of a "new generation" of clean planting materials is critical. At many nurseries starting 2016 and beyond, Protocol 2010-derived materials are now available - especially for rootstock varieties. These materials have all passed through a tissue culture disease elimination program and are "theoretically" free of all known grapevine viruses and vitiviruses and Xylella fastidiosa (causative agent of Pierce's Disease) and Agrobacterium vitis - the crown gall bacterium. We will discuss the pathogen status of CDFA certified materials, new developments in diagnostics, and the importance of correct application of nursery methods to Protocol 2010 nursery stock. Since fall of 2013, Agri-Analysis has identified a number of GLRaV-3 positive samples from vineyards in Napa and Sonoma that were tested negative using the current commercial reagent (BIOREBA). Figure 1 is a set of data comparing the testing results of ten samples. One sample was tested positive for GLRaV-3 by both methods (left). Seven samples were tested positive for GLRaV-3 only when using Agri-Analysis reagent but not by Bioreba. These seven samples were first tested in December 2013 using cane samples (AA1, green) and re-tested in spring of 2014 using petiole samples (AA2, light green). Figure 1. The comparison of testing results of ten samples for GLRaV-3 by Bioreba and Agri-Analysis reagents. The majority of GLRaV-3 positive samples were tested positive by both methods. One such sample is shown as "positive" on the left. Seven field samples were tested negative for GLRaV-3 when using the BIOREBA reagent (blue), but consistently tested positive by the new detection reagent developed by Agri-Analysis. AA1 represents the result of testing cane materials in fall of 2013 (green). AA2 represents the result of testing petioles from the same plants in spring of 2014 (light green). Two negative control samples were tested negative by both methods (right). These results were presented at the national meeting of American Phytopathological Society held in August 9-13, 2014 in Minneapolis, MN. To read more see previous update below. Synopsis. THE DISCOVERY OF GRAPEVINE Red Blotch-associated Virus (GRBaV, Red Blotch) in 2012 focused the industry on Red Blotch disease—an unknown condition with recognizable symptoms that growers had been aware of for some time. GRBaV has been found in new planting materials as well as in established vineyards in California and several other winegrowing states in the U.S. During the past 24 months, in an effort to curb disease spread, key stakeholders from the “farm-to-table” supply chain have invested significant time and money to better understand GRBaV. Universities, nurseries, growers, professional associations, industry leaders and testing laboratories have played a critical role in addressing this emerging challenge to the wine industry. Read the full article (pdf) by James A. Stamp, Ph.D., Alan Wei, Ph.D. as featured in Wine Business Monthly. "2014 ROOTSTOCK - PLANTING NEW IDEAS INTO THE FURURE"
Agri-Analysis is a proud contributor to the American Vineyard Foundation and to UC Davis for grapevine red blotch research. Please contact Scott at AVF, Michael Sipiora or Bob Steinhauer. Grapevine leafroll associated virus 3 (GLaV-3) is, arguably, the No. 1 most economically important virus in grapevine production and is designated as an exclusion pest in most certification programs. However, growers are often frustrated to find this virus in their vineyards and in certified nursery stocks. Since GLRaV-3 is known to be genetically highly variable, we suspect that certain strains may have escaped detection during certification. “Such genetic variability has significant implication in the detection of GLRaV-3 by molecular means and serological assays,” said Dr. Tefera Mekuria, plant virologist at Agri-Analysis. Advances in new testing methods are needed to help address this important issue. Funded by a USDA Small Business Innovative Research (SBIR) Grant, Agri-Analysis has recently developed a new ELISA-based reagent that provides broader coverage of GLRa-V3 variants than the commercial reagent currently in use by most State certification programs. Since fall of 2013, Agri-Analysis has identified a number of GLRaV-3 positive samples from vineyards in Napa and Sonoma that were tested negative using the current commercial reagent (BIOREBA). Figure 1 is a set of data comparing the testing results of ten samples. One sample was tested positive for GLRaV-3 by both methods (left). Seven samples were first tested in December 2013 using cane samples (AA1, green) and recently re-tested in spring of 2014 using petiole samples (AA2, light green). These seven samples were tested positive for GLRaV-3 only by Agri-Analysis reagent but not by the Bioreba reagent. Two control samples were tested negative for GLRaV-3 by both methods (right). The new reagent should have implications in State certification programs because most certification progams use the Bioreba reagent which we believe may have let certain variants of GLRaV-3 escape detection. Figure 1. The comparson of testing results of ten samples for GLRaV-3 by Bioreba and Agri-Analysis reagents. The majority of GLRaV-3 positive samples were tested positive by both methods. One such sample is labeled as "positive" on the left. 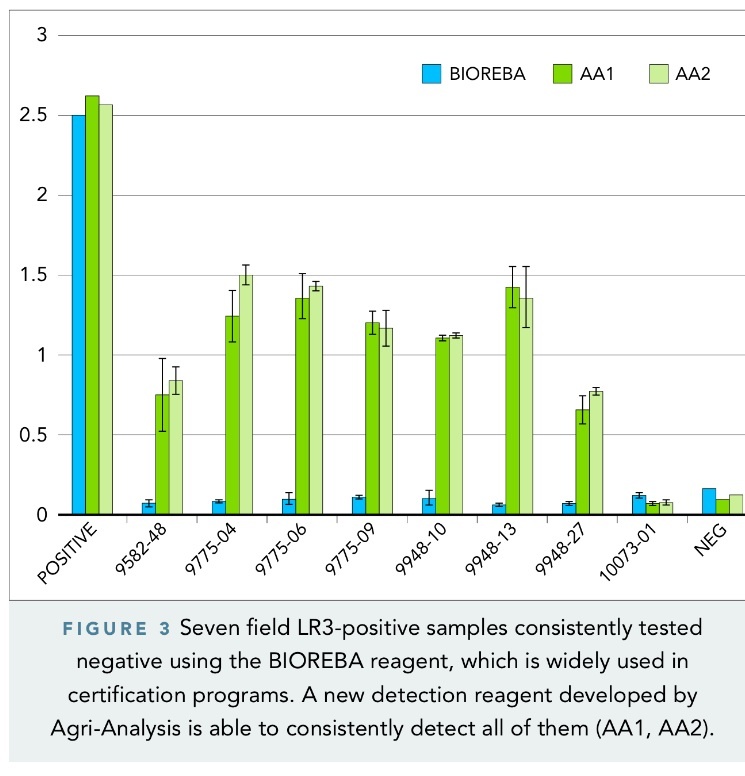 Seven field samples were tested negative for GLRaV-3 when using the BIOREBA reagent (blue), but consistently tested positive by the new detection reagent developed by Agri-Analysis. AA1 represents the result of testing cane materials in fall of 2013 (green). AA2 represents the result of testing petioles from the same plants in spring of 2014 (light green). Two negative control samples were tested negative by both methods (right). These results were presented at the national meeting of American Phytopathological Society held in August 9-13, 2014 in Minneapolis, MN. Could some strains of GLRaV-3 have escaped detection during certification? Dr. Monica Cooper, Napa County farm advisor, UC Cooperative Extension, has been studying the epidemiology of GLRaV-3 for a number of years. When asked for her opinion why the GLRaV-3 virus is found in certified materials, Dr. Cooper commented that “detection reagents could be one explanation. In 2010, I did work with a grower who had LR3(+) vines with clear symptoms that consistently tested negative.” Later, the research laboratory of Dr. Rodrigo Almeida at UC Berkeley was able to isolate a novel variant of LR3 from the samples. “Anything we can do to improve the reagents will certainly make it easier to clean up our vineyards and nursery material over the long-term. I hope that the certification programs in California and other states are keeping updated on their virus testing methods and protocols.” said Dr. Cooper. (Reference: "Red Blotch Disease and the Virus Status of CDFA Certified Nursery Stocks", by Stamp and Wei, Wine Business Monthly, August, 2014 https://www.napagrowers.org/in-the-vineyard/pests-disease/red-blotch/). Grapevine leafroll associated virus 3 is a filamentous single stranded RNA virus of 1,800 to 2,000 nm in length and 12 nm in diameter (see Figure 2 below). In an economic impact study by researchers from UCD, the infection rate by GLRaV-3 was estimated to be about 30% in Napa/Sonoma vineyards, and the annual loss to growers was about $88 million (http://vinecon.ucdavis.edu/publications/cwe1306.pdf). In a separate economic impact study by Cornell researchers, the estimated economic impact of grapevine leafroll diseases (GLRD) ranged from approximately $25,000 for a 30% yield reduction and no grape quality penalty to $40,000 per hectare for a 50% yield reduction and a 10% penalty for poor fruit quality in the absence of any control measure. The per hectare impact of GLRD can be substantially reduced to $3,000–$23,000 through roguing if the level of disease prevalence is moderate (1–25%) (http://ajevonline.org/content/63/1/73.full.pdf). Figure 2. Electron Micrograph of Grapevine Leafroll associated Virus type 3 (1800 to 2000 nm in length and 12 nm in diameter). For more information, please contact Dr. Alan Wei at apwei@agri-analysis.com. THE DISCOVERY OF GRAPEVINE Red Blotch-associated Virus (GRBaV, Red Blotch) in 2012 focused the industry on Red Blotch disease—an unknown condition with recognizable symptoms that growers had been aware of for some time. GRBaV has been found in new planting materials as well as in established vineyards in California and several other winegrowing states in the U.S. During the past 18 months, in an effort to curb disease spread, key stakeholders from the “farm-to-table” supply chain have invested significant time and money to better understand GRBaV. Universities, nurseries, growers, professional associations, industry leaders and testing laboratories have played a critical role in addressing this emerging challenge to the wine industry. Read the full article (pdf) by James A. Stamp, Ph.D., Alan Wei, Ph.D. as featured in Wine Business Monthly. While many of you have visited us in person, most of you have not been to the lab. Here, I am very proud to introduce your dedicated staff at Agri-Analysis. Everyone takes great pride in our work to provide you with the fastest and the most reliable grapevine testing service in the industry. At Agri-Analysis, our mission is to help growers plant virus-free vineyards and to protect their investment. We strive to accomplish this mission by a) building a company that our employees are proud of; b) providing the most innovative products and services; c) satisfying the articulated and/or unarticulated need of our customers; and d) our strong commitment to community service, education and outreach. * Responsible for sample preparation, PCR and microbiology. * Over 30 Years Industrial R&D Experience. A year ago, we did an analysis of the RBaV virus level in different parts of a green bench graft. Since new subscribers have not seen the result and many growers are still very much interested in this question, we decide to re-post the result again here. We encourage growers to continue to approach the RBaV virus testing from a statistical perspective by selecting the appropriate sample size in order to achieve the growers' testing objectives in a statistically significant manner. In this regard, we would like to draw your attention to the following references. Sample Description: CS08 scion was bench grafted onto to 110R rootstock by a grapevine nursery in January of 2013. The vine was grown in green house after callus. 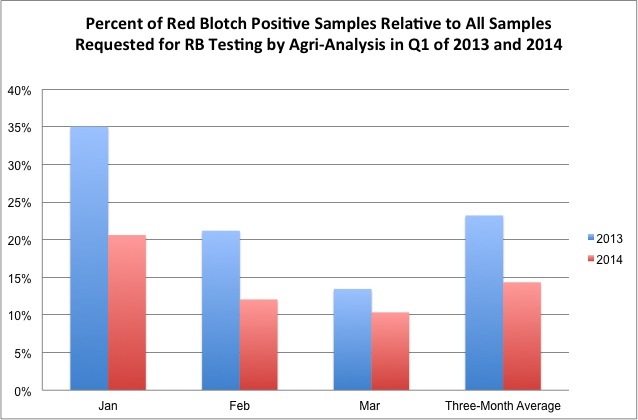 Samples were submitted to Agri-Analysis for Red Blotch virus testing in late March by a grower. EXPERIMENTAL METHODS. Four separate preparations were made from four different portions of one "green" benchgraft: 1. new green tissue; 2. scion wood; 3. rootstock closer to the graft union; 4. rootstock further away from the graft union. The samples were analyzed by both conventional PCR and quantitative PCR (qPCR). Green Tissue had relatively Low level of red blotch virus. The relative viral DNA copy number was determined to be = (290+/-89) by qPCR. Scion Wood had the highest level of red blotch virus. The relative viral DNA copy number was determined to be = (5,450+/-861) by qPCR. Rootstock Close to Graft Union had modest level red blotch virus. The relative viral DNA copy number of was determined to be = (1,840+/-914) by qPCR. Rootstock Further Away from Graft Union: No red blotch virus was detected by conventional PCR or qPCR. CONCLUSION. The relative virus level in the green growth, the scion, the two rootstock portions #3 and #4 was found to be 1 : 19 : 6 : 0, respectively. In other word, the virus level in the green growth is about 5% of that in the scion wood. This result suggests that the CS08 scion wood was most likely infected before grafting. The virus level in the new green growth was about 5% of that in the scion wood. By comparison, the virus level in the upper portion of rootstock was about 17% of that in the scion wood. We expect the viral copies to increase as the growth continues. CDFA PD/GWSS Board To Discuss Red Blotch and Vine Mealybugs on April 25. The CDFA Pierce’s Disease/Glassy-Winged Sharpshooter (PD/GWSS) Board is scheduled to hold "designation discussions" on BROWN MARMORATED STINK BUG, VINE MEALYBUG and RED BLOTCH on April 25. For more details, please visit CDFA web site. CURRENT ISSUES: AN IN-DEPTH LOOK AT RED LEAF VIRUSES. Please visit the UCD Viticulture and Enology Web Site for Registration and contact information. We are pleased to share some information on the incidence rate of RBaV infected vines based on all samples we tested in the first three months of 2014. As shown in the graph below, the percent RBaV infected vines is lower in each of the three months of this year than the corresponding period a year ago. This result represents the result of all samples we tested in Q1 of 2014 from various locations and and diverse sources including both nursery materials as well as field cuttings. During this period, vast majority of samples were dormant materials without symptoms that were primarliy destined for new planting for the 2014 or 2015 season. We applaud your efforts in lowering the incidence rate because this result shows that the community wide efforts in combating this virus are starting to produce benefits. We encourage growers to continue to be vigilant in screening new planting materials for RBaV and LR3 - two of the most economically important grapevine viruses. Red Blotch Incidence in Q1 of 2013 and 2014. As you know, during the past eighteen months, red blotch has been of great concern to growers due to its negative effect on grape and wine quality. Many articles and presentations are available in the open literature. CDFA have held open hearings to decide if to classify it as a pest. As a result, growers have been vigilant in testing for red blotch virus in an effort to screen it out of your new planting materials. At the same time, I would like to remind everyone that Leafroll 3 virus is still very much prevalent in our vineyards and planting materials. A recent UC Davis study reported 30% vines in the field currently have Leafroll 3 in the Napa-Sonoma region and infected vines on average has a 35% lower in yield. This resulted in an estimated annual loss of $88 million by LR3 alone in Napa and Sonoma wine growing regions (http://vinecon.ucdavis.edu/publications/cwe1306.pdf). We conduct random surveys of customer samples that were received for red blotch virus testing only. We often found Leafroll 3 in them and informed growers promptly. So, please do not forget to test for Leafroll 3 even though it was in the exclusion program. Thank you for your attention. It is truly a community wide effort. A recent UC Davis study reported 30% vines in the field currently have Leafroll 3 in the Napa-Sonoma region. Infected vines on average has a 35% lower in yield. The economic loss to growers in this region was estimated at $88 million annually by leafoll 3 alone (see link #1 below). The red blotch virus was newly discovered in 2012. While the discovery of this virus was new, growers have experienced the red blotch disease for many years. RBaV has been reported to cause delayed ripening, decline in sugar, tannin and anthocyanin levels and change in wine flavor. A report presented at the recent Unified Symposium by the winemaker from one of Napa’s famed wineries suggested that instead of returning as much as $90,000 per acre from healthy vines for a $100 per bottle wine, red blotch infected vines may only produce wines sold as bulk returning $10,800 per acre (link #2 below). Since RBaV was NOT part of the CDFA certification program for exclusion, one could suspect that the RBaV infection rate in the field are much higher than that associated with LR3. Pest and disease control is one of your most important priorities. We believe that effective testing has to be an integral part of any management program, certification program, or regulatory legislation in order to mitigate risks of these viruses. The spring season offers the best opportunity to screen these harmful viruses out of new planting materails and therefore out of our valued vineyards. I am pleased to let you know that Agri-Analysis has added new skilled personnel to our staff in order to meet your requirement for high throughput screening and fast turn around from sample-to-result. I encourage to take a look at our online brochure (link #3) and to call us to discuss sampling strategies and sample size in order to reach sttastistically significant testing result. What we do about red blotch? How many vne samples are sufficient? Since my communication last fall on sampling statistics, many growers have asked the question of how many samples are sufficient in order to achieve statistically significant testing result? I took the information from our brochure, and made a table on the right to show the sample size in relation to the total number of plants to be sampled. This table is valid under the assumptions listed. As you know, in real world, the sample size is dependent on a number of complex factors. This example intends to encourage growers to approach the clean plant testing from a statistical perspective. l invite you to please conatct me and our Grapevine Virologist Dr. Tefera Mekuria to discuss your specific need. Suggested Sample Size in Relation to the Total Number of Plants to be Sampled From. Assumptions: random and uniform infection at estimated infection rate of 15%. Confidence level is 95% and margin of error is 5%. Result Interpretation. Based on the table below, if a grower is planning to plant 10,000 new plants, the grower would need to take 193 sample for testing. If all of 193 samples test negative (0%) for grapevine red blotch virus, the infection rate would be estimated to be 0+/-5% with 95% confidence. "The Impact of Grapevine Red Blotch Virus" by Stamp and Wei in March, 2013 WINE BUSINESS MONTHY. Publisher's permission was obtained for the unrestricted distribution of this article. As you gear up for the new planting season, Agri-Analysis is prepared to support you with innovative testing technologies and services to help screen larger number of new planting materials at lower cost. Since 2011, Agri-analysis has been a recipient of the prestigious Small Business Innovation Research (SBIR) grant from USDA (Phase I). The SBIR grant is highly competitive with an average success rate of 10%. Agri-analysis was truly humbled and honored to be selected among many national peers. One objective of this research to develop new reagents and methods for faster, more reliable and cost effective screening of grapevine viruses. I am pleased to let you know that, while much work remains to be done, we have made important progress that allows us to conduct fast and high throughput screening of red blotch virus and leafroll 3 virus in grapevines which are the two most damaging viral pests to wine grape production. We are in process to submit a Phase II SBIR application to expand the method to other grapevine pathogens. l invite you to please conatct me to discuss how these latest research ad technologies could be applied to your specific need. One of the most common questions from growers when conducting virus testing is how to take samples so that the testing result is representative of the actual condition in the vineyard or in the new planting materials. This question becomes much more profound during winter and spring season when there are no symptoms to watch for. As important as it is, this topic has received relatively little attention by the grapevine research community. As a result, publications on grapevine sampling statistics are scarce. Historically, the seed health community has been very active in the studies of sampling statistics. Lettuce mosaic virus testing has been a significant portion of Agri-Analysis' services. We conduct seed health statistics routinely in order to meet the CA seed law standard of zero in 30,000 lettuce seeds. Here I would like to share our experience in applying fundamental statistical concepts to assist clients in their selection of grapevine samples for virus testing. The objective is to assist growers obtain statistically significant results with minimal number of samples therefore maximizing the return of their investment on testing services. I am happy to say that statistically significant results are achievable with relatively small number of samples under the assumption of random and homogenous distribution of an infection. This is indeed good news to growers. Real-world sampling of vineyard and nursery materials is often more complex. Please feel to call me to discuss your specific testing objectives and sampling strategy. I will be making a presentation on this subject on November 14 at the Napa Growers Association meeting. I welcome and appreciate your comments and suggestions. 1. Statistical Level of Confidence. The confidence level is the amount of certainty in estimating the true answer based on the testing results of selected samples. The true answer is the percentage you would get if you exhaustively tested every vine. 95% confidence level is commonly accepted in most agriculture applications. Higher confidence level requires a larger sample size. 2. Margin of Error. The margin of error is the amount of error in estimating the true answer based on the testing results of selected samples. Lower margin of error requires a larger sample size. Typical margin of error is 5%. 3. Estimated Infection Rate. If the sample is skewed highly one way (high positive or negative rate), the population probably is, too. Higher skew level requires a smaller sample size than non-skewed samples (50:50). 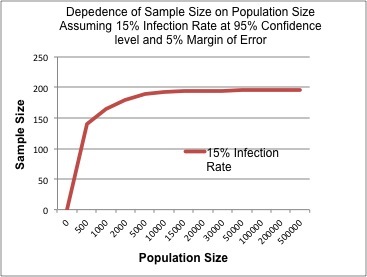 Below is a simulated graph to show the dependence of sample size (Y axis) on the infection rate (X axis) for a population size of 20,000 at 95% confidence level and 5% to 10% margin of error. In this example, the grower would randomly select 200 samples from a total of 20,000 vines (1%). At 95% statistical level of confidence, if the true infection rate is 15% or less, the estimated infection rate would have a margin of error of 5% or less. 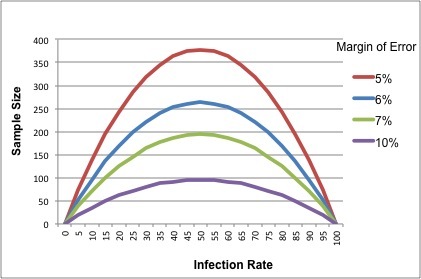 If the true infection rate is between 15% to 50%, the estimated infection would have a margin of error of between 5% to 7%. Since most grapevine infections are low level (~15%), this result indicates that statistically significant testing result is achievable with relatively small number of samples. Statisticians know statistical theory for why small sample sizes are adequate. The analogy is the chef and his soup: every chef knows that it only takes a single sip from a well-stirred soup to determine its taste. Below is a simulated graph to show the dependence of sample size (Y axis) on the population size (X axis) ranging from 500 to 500,000 at 95% confidence level and 5% margin of error. The sample size does not change significantly for populations larger than 5,000. This result is very good news for growers who have to screen a large number of vines. The above discussions were based on the assumption that the infection is homogeneously and randomly distributed. Practical situations are often much more complex. Nevertheless, tools such as these can help guide growers through the initial screening process based upon which improvements could be made as needed. In this regards, we have learned valuable experience in advising clients as well as learning from them. c). Progressive sampling where samples from a small population are tested first before a large population pool is sampled. d). Stratified sampling where sub-samples are taken from each grape variety. e). Investigative sampling where clients were trying to identify the source of infection (e.g. scion or rootstock). It is with great pleasure that I welcome Dr. Tefera Mekuria to join Agri-Analysis as a senior virologist and plant pathologist. Dr. Mekuria is a recognized expert in grapevine virus research. He has published widely in high impact journals such as Phytopathology and Molecular Plant Microbe Interactions, Archives of Virology and Pant Diseases. Prior to joining Agri-Analysis, Dr. Mekuria was a research associate for six years at Washington State University with extensive experience in different grapevine and tree fruit viruses and virus like agents. Tefera earned his Ph.D. in Plant Pathology from Oklahoma State University. C. Testing Services and Client outreach. During the next a few weeks, I will be contacting many of you to arrange for Dr. Mekuria to visit your vineyards. He will also be making a presentation at the Napa Valley Growers' Grape+Wine Expo on November 14, 2013 and also participate in the North Coast Wine Industry Expo on December 5th, 2013. Current Issues in Vineyard Health on November 22. America Vineyard Foundation Funding Decision Announced. The 2013-2014 funding decisions for the American Vineyard Foundation have been finalized and posted on the UGMVE website. Funded projects cover wide range of research areas vital to the wine grape industry including two projects related to red blotch virus research led by researchers at UC Davis and Cornell. During the recent ASEV national conference held in Monterey, CA, Dr. Marc Fuchs, Cornell University, reported their most recent work to prove Koch's postulates for RBaV. They first isolated the viral DNA from infected vines, transformed it into a "carrier" - agrobacterium. 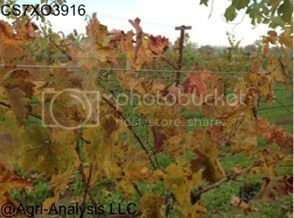 Healthy grapevines were soaked in a solution of the carrier agrobacterium, and 4 to 6 months after infection, the grapevines started to show red leaf symptoms. 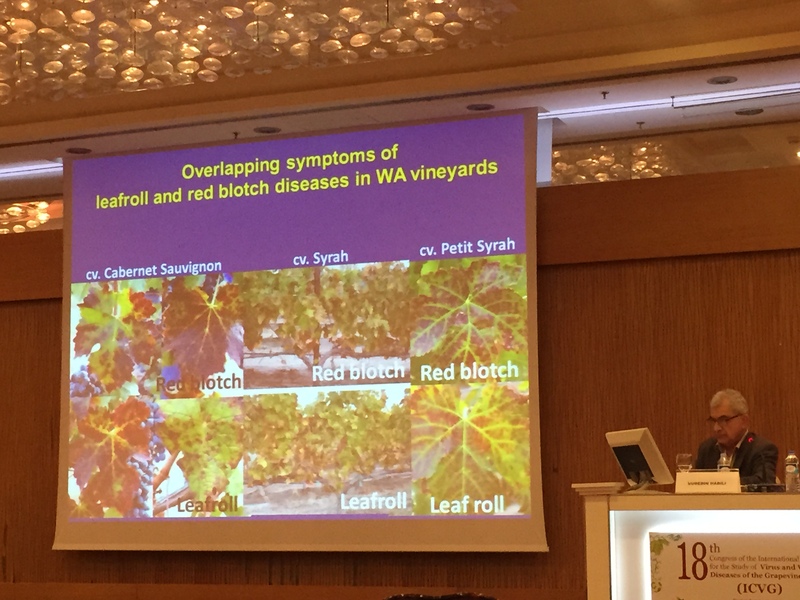 "Based on these and other results and studies, I am confident that RBaV is the causal agent of red blotch disease observed in California and other grape growing regions", said Dr Fuchs. Dr. Mysore Sudarshana, Research Biologist, USDA-ARS, recently received special USDA funding to conduct research on determining insect vectors capable of transmitting grapevine red blotch-associated virus in California Vineyards. To this end, Dr. Sudarshana is looking for volunteer vineyards to cooperate on his research. He is particularly interested in organic vineyards where red blotch disease is prevalent where he can look for leafhoppers that may be collected and tested for the presence of the virus. Cooperation from growers important in developing guidelines for the management of this newly described disease. please contact Dr. Sudarshana at (530)752-3621 or mrSudarshana@ucdavis.edu. GRBaV is widely found in grapevine nursery stock and established vineyards. Vines with foliar symptoms were tested positive; vines without foliar symptoms were negative. Infected grape varieties include not only reds such as Merlot, Zinfandel, Mouvedre, Petite Sirah, Cabernet Franc, Cabernet Sauvignon, Malbec, Pinot Noir and Petit Verdot, but also white varieties such as Chardonnay, Sauvignon Blanc and Riesling. Preliminary indications suggest that it could cause potentially serious damages including vine decline, delayed ripening, low yield, and low sugar content. Learn more about GRBaV from our recommended reading list and contact Alan Wei at 1.800.506.9852 for your testing needs. "The Impact of Grapevine Red Blotch Associated Virus", James Stamp and Alan Wei, Wine Business Monthly, March 2013. "Association of a DNA virus with Grapevines affected by Red Blotch disease in California". Al Rwahnih M, Dave A, Anderson MM, Rowhani A, Uyemoto JK and Sudarshana M. Phytopathology. May 8 2013. "A Leafhopper-Transmissible DNA Virus with Novel Evolutionary Lineage in the Family Geminiviridae Implicated in Grapevine Redleaf Disease by Next-Generation Sequencing", S Poojari, OJ Alabi, VY Fofanov and RA Naidu. PLoS ONE 8(6), 2013. "Complete Genome Sequence of a New Circular DNA Virus from Grapevine", Björn Krenz, Jeremy R. Thompson, Marc Fuchs and Keith L. Perry, J. Virol. 2012, 86(14):7715. "Grapevine geminivirus isolate 3138-03, complete genome", Rott ME and Belton M. Aug 29, 2012. "Grapevine geminivirus isolate JRT17NOV10, complete genome", Krenz B, Thompson JR, Fuchs M and Perry KL April 4, 2012. "Grapevine geminivirus, complete genome", Krenz B, Thompson JR, Fuchs M and Perry KL April 4, 2012. "Koch's Postulates for Grapevine Red Blotch Associated Virus - A Story of Three Vines", Agri-Analysis LLC, February 2013. 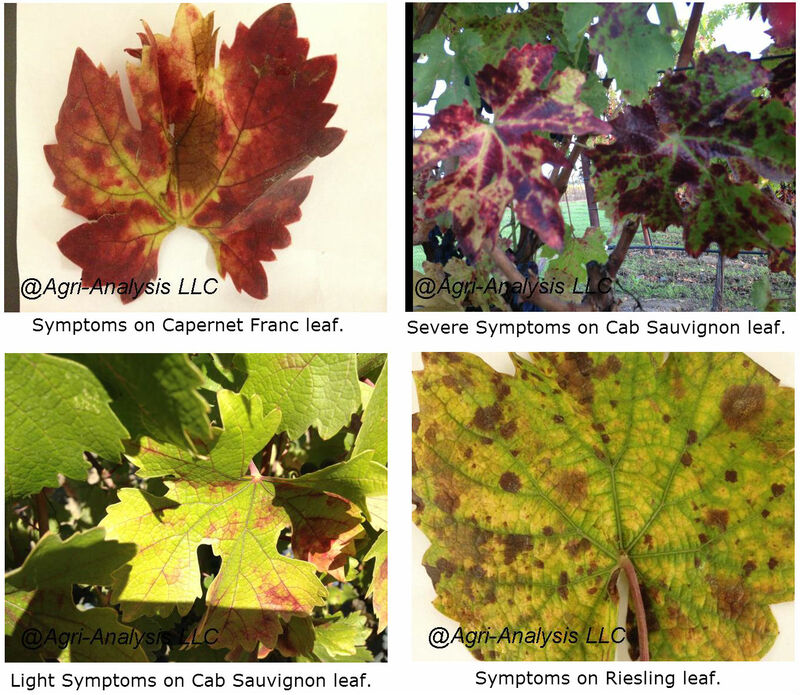 "Grapevine Red Blotch Associated Virus Level in New Green Tissues", Agri-Analysis LLC, May 2013. "Red Blotch Disease Sparks Collaborative Research Effort with Lead Funding by the American Vineyard Foundation", American Vineyard Foundation, May 23, 2013. 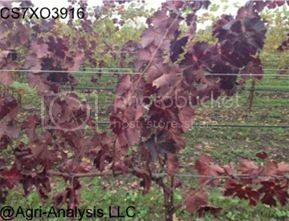 "Grapevine Red Blotch Associated Virus - A Brochure", Agri-Analysis LLC, October 2012. Red Blotch Virus Update: Green Shoots or Lignified Canewood? EXPERIMENT METHODS. Four separate samples were prepared from four different four portions of one "green" benchgraft: 1. new green tissue; 2. scion wood; 3. rootstock closer to the graft union; 4. rootstock further away from the graft union. Conventional PCR was conducted by Agri-Analysis. Quantitative PCR (qPCR) was independently conducted in the laboratory of Dr. Mysore Sudarshana, USDA/ARS at UCDavis. Sample #1. Green Tissue: Low level of red blotch virus was observed by conventional PCR. The virus DNA copy number of RBaV was determined to be = (290+/-89) by quantitative PCR (qPCR). Sample #2. Scion Wood: High level of red blotch virus was observed by conventional PCR. The relative DNA copy number of RBaV was determined to be = (5,450+/-861) by quantitative PCR (qPCR). Sample #3. Rootstock Close to Graft Union: Modest level of red blotch was observed by conventional PCR. The relative DNA copy number of RBaV was determined to be = (1,840+/-914) by quantitative PCR (qPCR). Sample #4. Rootstock Further Away from Graft Union: No red blotch virus was detected by conventional PCR. The DNA copy number of RBaV was determined to be = 0 by quantitative PCR (qPCR). This experiment suggests that the CS08 scion wood was most likely infected before grafting. The virus level in the new green growth was about 5% of that in the scion wood. By comparison, the virus level in the upper portion of rootstock was about 17% of that in the scion wood. We would expect these numbers to increase as growth continues. CDFA PD/GWSS Board Discussed Red Blotch on April 29. The California Department of Food and Agriculture’s (CDFA) Pierce’s Disease/Glassy-Winged Sharpshooter (PD/GWSS) Board held a lengthy discussion at its April 29 meeting regarding the designation of red blotch disease as a new disease for the Board to target for research and funding, but decided to defer a vote on the designation until its next meeting, scheduled for June 21. For more details, please visit. I am pleased to draw your attention to the article in the March issue of WBM entitled "The Impact of Grapevine Red Blotch Virus - Grapevine red blotch-associated virus found in grapevine nursery stock and established vineyards", co-authored by Dr. James Stamp and myself. As a trade magazine article, it is not intended to provide systematic scientific study of this virus. Rather, it provides an up-to-date summary of observations, learnings and opinions through our own work and through our interactions with many of you during the past few months. On Feb 20, 2013, after a period of careful study and evaluation, UCD-FPS announced its official position on the grapevine red blotch virus which encourages vineyard managers and owners to test this virus in their vineyards and new planting materials. For many years, growers have observed the impact of this virus, but their experience of RBaV has not been the same: Some growers report low Brix in certain affected varieties or clones but not others; Some growers reported little change in Brix but observed "poor flavor" of fruits from infected vines; Some growers spend 15 to 20% extra management effort and cost in order to keep the infected vines productive, while some growers decide to take the infected plants out; Some growers tolerate certain levels of infection in their selection for new planting materials, while others would have zero tolerance for it. I would greatly appreciate your crucial review and comments of this article. Please do not hesitate to contact me or Dr. James Stamp if you need any more information. We Help Protect Your Investments. It is imperative that funding be generated to support the research work of USDA/ ARS, UC Davis and Cornell scientists. March 6: NAPA VALLEY GROWERS ASSOCIATION EVENT ON SUSTAINABLE VINEYARDS PRACTICES. Presentations include: 1) Vine Mealybug Population by Joel King of Napa County; 2) Vine Mealybug Management by Ashfaq Sial and Brian Hogg of UC Berkeley; 3) Virginia Creeper Leafhopper by Lucia Varela of UC IPM. 4) Next Generation Sequencing and Grapevine Red Blotch-Associated Virus by Maher Rwahnih of UCDavis FPS; 4) Grapevine Leafroll Disease Management by Monica Cooper of UC Extension. Please register here. Cornell University virologist Marc Fuchs, UC Cooperative Extension Advisor Rhonda Smith, and UC Davis Foundation Plant Services director Deborah Golino will describe the virus, its impact on vine health, what informal field observations have told us, and what measures are being taken to test and identify infected vines and planting material. Please register here. UCDAVIS FPS POSITION ON RED BLOTCH VIRUS. On Feb 20, 2013, Ucd-fps announced its official position on grapevine red blotch virus which encourages vineyard managers and owners to test this virus in their vineyards. For more details, please visit here and also the FPS Blog. BROCHURES ON GRAPEVINE RED BLOTCH VIRUS. Agri-Analysis Brochure is available online. UCDavis/USDA-ARS Brochure is available online. I would like to share three photos taken by an observant customer in early December. The cultivar is cabernet sauvignon clone 7 on rootstock O3916. The first vine looks normal for the season. The second vine has speckled red leaves. The third vine has completely red leaves. We conducted 19-virus extensive panel analysis of these three samples. For red blotch associated virus (RBaV) analysis by conventional PCR, we found one sample gave no band, one gave a band of weak-to-intermediate intensity and one gave a strong-intense band on the DNA gel. The DNA copy numbers of RBaV were determined independently by Dr. Sudarshana's lab at UCDavis/ARS . The severity of symptoms does seem to correlate with the viral DNA copy numbers. If you see similar vines in the field, please let me know, as this is a critical piece of information to satisfy the modern version of Koch's postulates - to correlate the viral gene copy number with the disease severity of the host. Sample #1. Normal and green foliage: RSP and RSP-Sy were positive. RBaV and sixteen viruses were negative. No PCR gel band of RBaV was observed by conventional PCR; the relative DNA copy number of RBaV was zero by quantitative PCR (qPCR). Sample #2. Speckled red foliage: RBaV was positive. All other eighteen viruses were negative. A weak-to-intermediate PCR band of RBaV was observed by conventional PCR; the relative DNA copy number of RBaV = 200+/- by qPCR. Sample #3. Complete red foliage: RBaV was strongly positive. All other eighteen viruses were negative. A strong PCR band of RBaV was observed by conventional PCR; the relative DNA copy number of RBaV = 80,000+/- by qPCR. A full day of presentations by researchers describing their current projects will be hosted by FPS and Dr. Debora Golino on Feb, 21. Please register here. For FBS Annual meeting on Feb 20, please register here. Please do not hesitate to contact me if you need any more information. 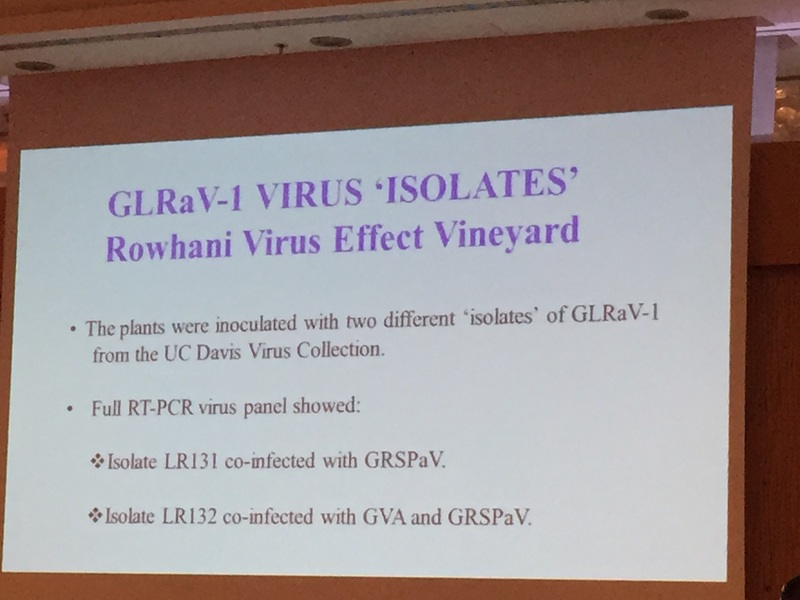 During the 17th scientific meeting of the International Council for the Study of Virus and Virus-Like Diseases of the Grapevine (ICVG) held at UC Davis, October 7-14, 2012, scientists from Cornell and UC Davis reported the discovery of a new grapevine virus. Dr. Keith Perry, Department of Plant Pathology of Cornell Univeristy, reported a new circular DNA virus from grapevine which is named "Grapevine cabernet franc-associated virus (GCFaV)". Dr. Mysore Sudarshana, USDA-ARS, Department of Plant Pathology of UC Davis reported a circular DNA virus in grapevines affected by red blotch diseases. They named this virus "Grapevine red blotch-associated virus (GRBaV)". It is believed that GCFaV and GRBaV are the same virus that belongs to the family of Geminiviridae. Noteworthy is the fact that it is a circular DNA virus composed of 3,206 nucleotides as opposed to linear RNA viruses which make up the majority of the grapevine virome.